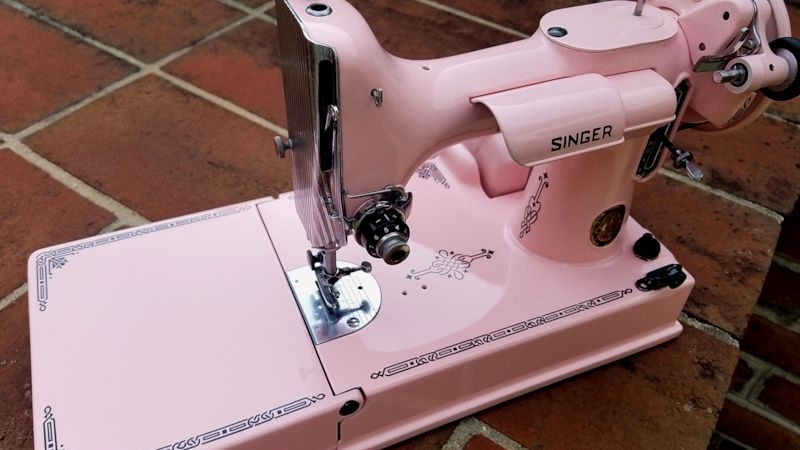 Articles, products, and services pertaining to classic heirloom-quality sewing machines, including the only feature-length documentary on vintage sewing machines ever produced. 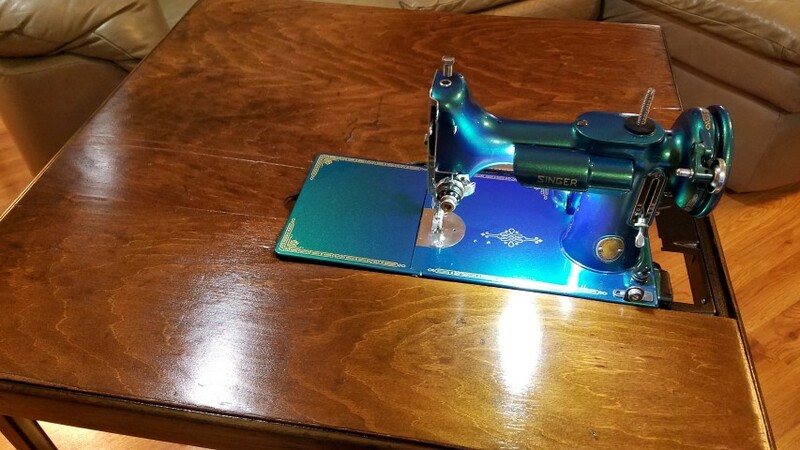 Even if you have no experience, you can refinish your vintage Featherweight table. With our method here, it can be accomplished in a weekend. You should read all of these instructions before attempting this project. We'll offer alternatives to some steps that can alter your final finish – some options are more challenging or time-consuming. Don't be overwhelmed by the amount of disassembly we demonstrate, as you may choose not to remove as many parts from your table. Notice the two tables below. We are going to refinish the table on the left, which is quite rough. Meanwhile, the table on the right needs only polish and some touch up with a furniture marker. The table on the left will benefit from refinishing. The table on the right just needs polish and a little "touch up." Let's briefly discuss the table on the right. 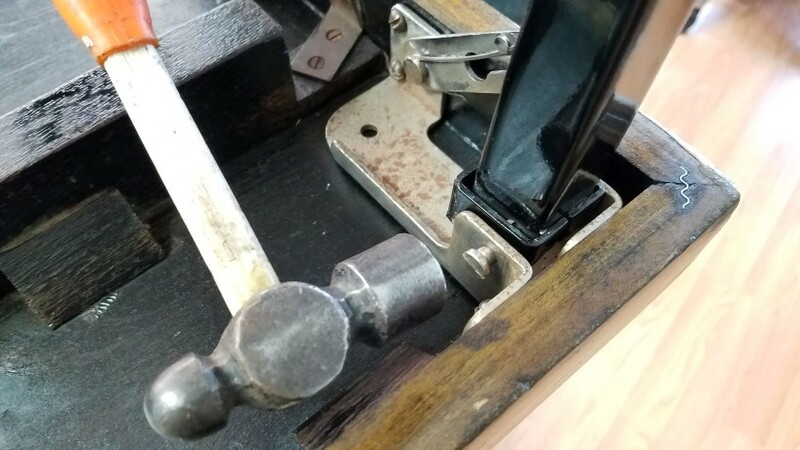 If you have nicks or minor gouges in the wood, including the black edges, you can utilize wood markers to apply touch up. Left, nicks in the black finish. On the right, repairs using a black furniture marker. 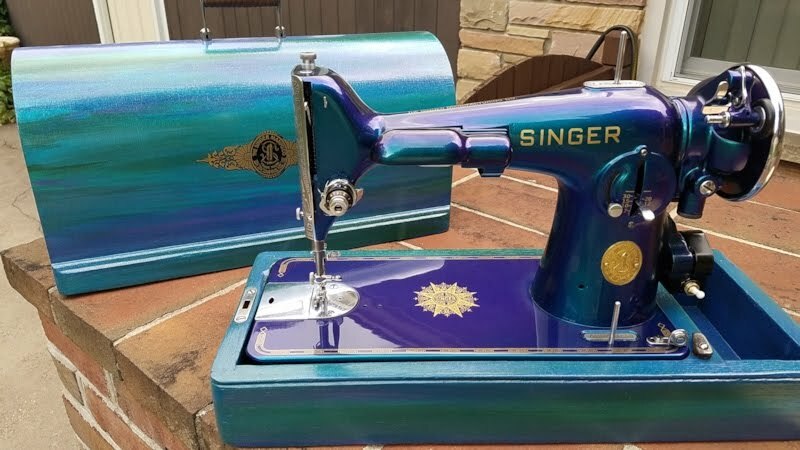 Vintage Singer products typically utilized quality wood veneer. 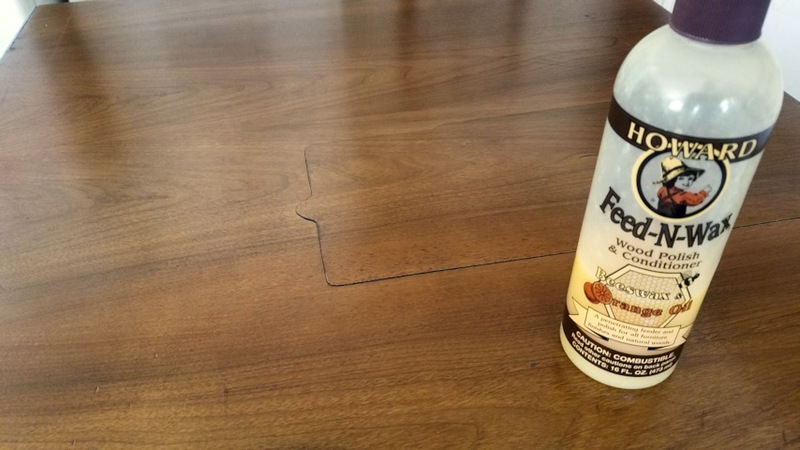 If your table is in decent condition, Howard's Feed-N-Wax Wood Polish & Conditioner is excellent for rejuvenating the wood. It can be used on the black edges as well. This table will benefit from a full refinishing. 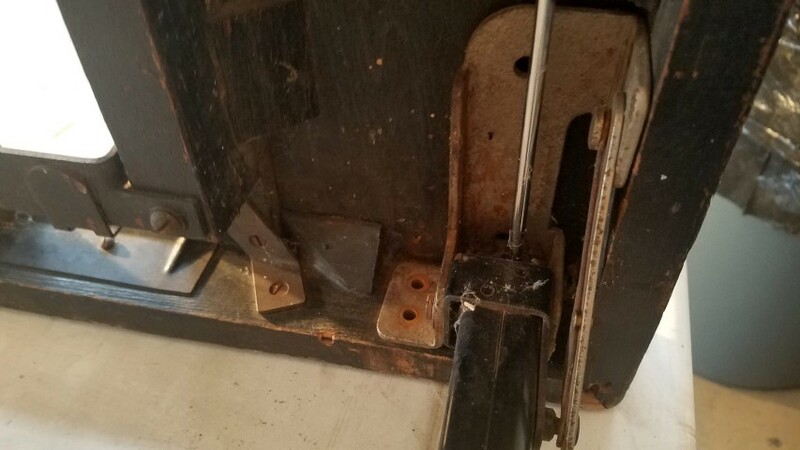 It would not be entirely necessary to remove the legs or their metal base and hinges. However, our legs are in poor condition and we want to repaint them. 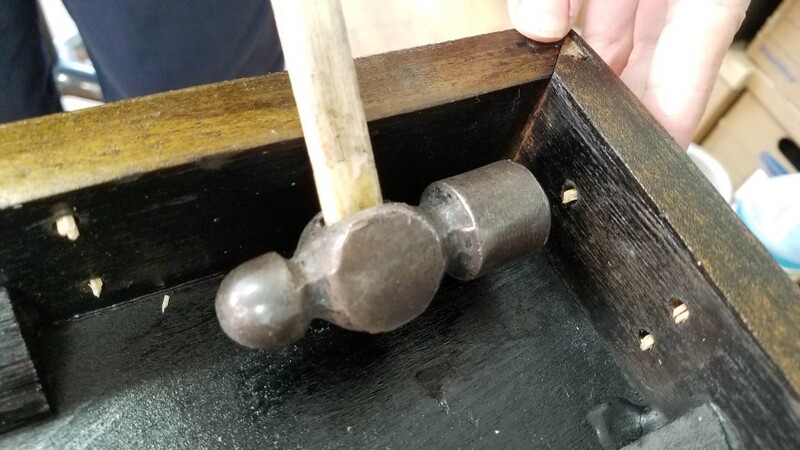 The hinges are speckled with rust, so we wanted to polish them well enough so that when the table is set up for use, the hinges will not detract from the overall appearance. Rather than removing your legs, you could choose to invert the table and simply clean the legs if they don't require repainting. You could polish the exposed sides of the hinges with the legs remaining installed, or skip that task entirely. You could even mask off the table bottom and repaint the legs while attached to the table. Before making your decision, read all these steps to see if you might want a more thorough job. Remove the four leg assemblies held in place each by five screws. 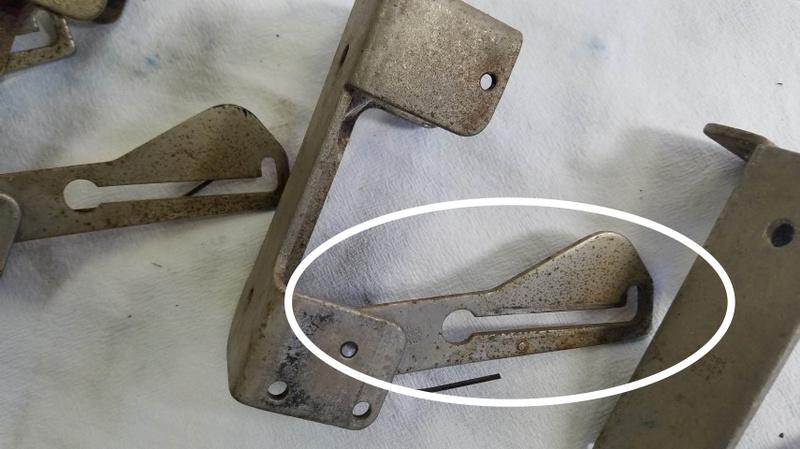 You could first pull the hinge pin that holds the leg to the bracket (discussed below). With the table on it's side, gravity can help you align your screwdriver more easily. In this image, we're removing the screw that is tucked behind the leg a bit. 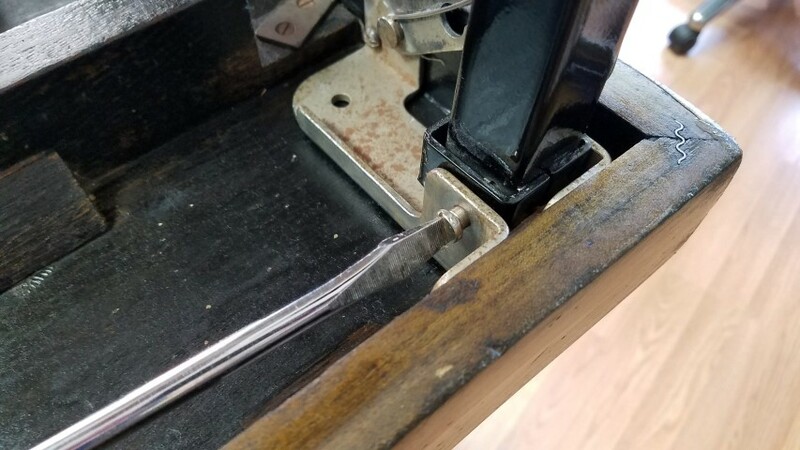 To separate the leg from the hinge, we must remove the hinge pin. 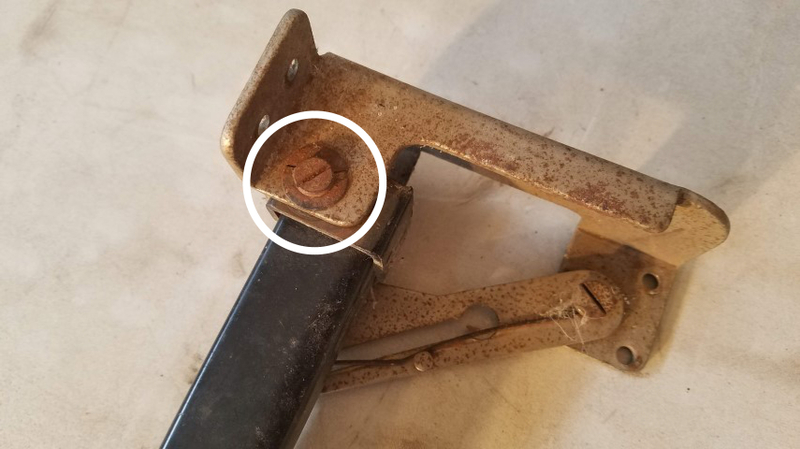 The hinge pin (circled) is unscrewed and slid out of the bracket. Unscrew the hinge pin, then pull it from the assembly. 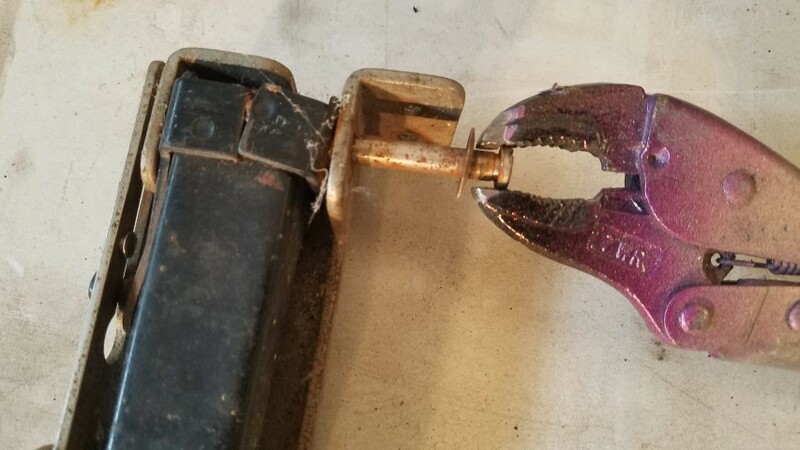 Pliers or locking vice-grips will help pull the pin from the bracket, but you must first unscrew it. Don't pull on your pin until you've unscrewed it. A little penetrating fluid can help free the pin more easily. A tab on the leg facilitates the motion of the leg in the hinge. It will be apparent to you how to move the hinge and leg so that the hinge can be separated from the leg. Align the tab on the leg with the hole on the hinge to separate the leg from the hinge. Below, you'll see that three of the four thin washers are cracked. You can purchase replacement washers at the hardware store. If unable to locate thin enough washers (and in opposition to normally sound manufacturing standards) you can trust us on this: you can reinsert these pins later without the washers - it will not impact the functionality of the table due to the way the pins seat and are not subjected to pressure when the hinges rotate. 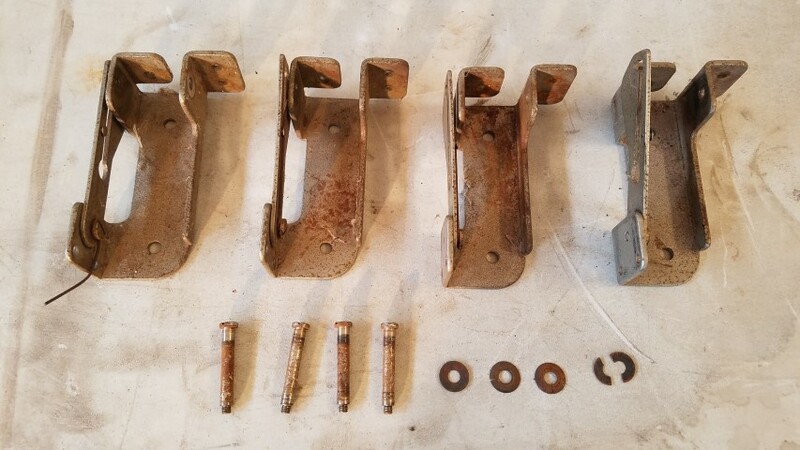 The hinges, pins, and washers. Notice that our table is an older model with the silver brackets and hinges. You may have one of the later models with black metal hinges that require nothing more than a light cleaning. 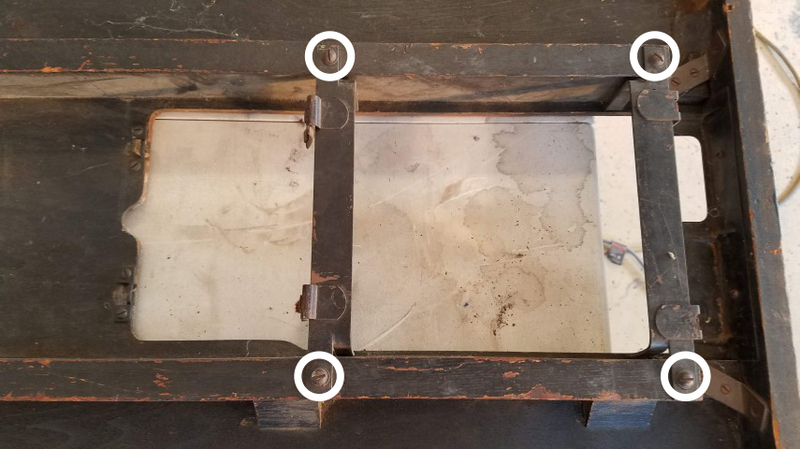 This table has more modern black hinges that required nothing more than a gentle cleaning. 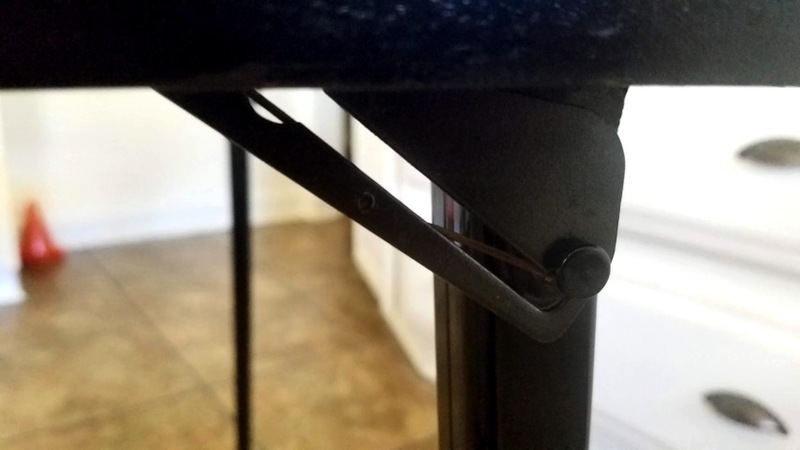 The tips of the legs are metal and won't protect the floor. One tip is missing. 3/4" slip-on chair leg tips will work well on the legs on our Featherweight table. 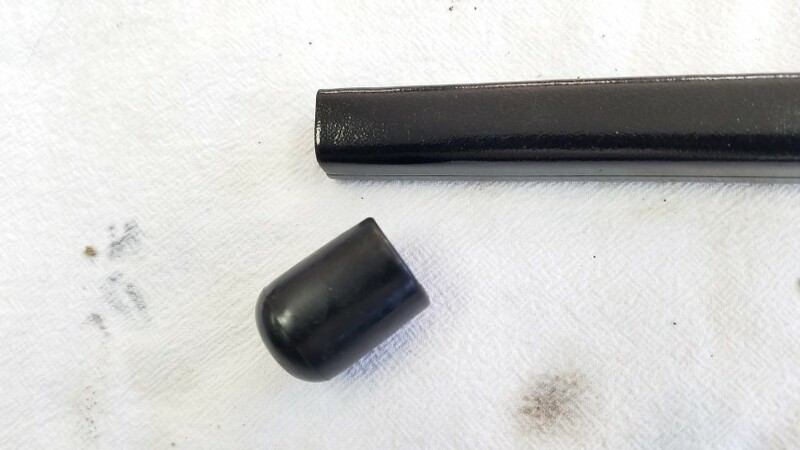 If you have metal tips that are intact, you could later slip a protective rubber/vinyl product over the metal tip. If your leg tips meet your satisfaction, please leave them in place. 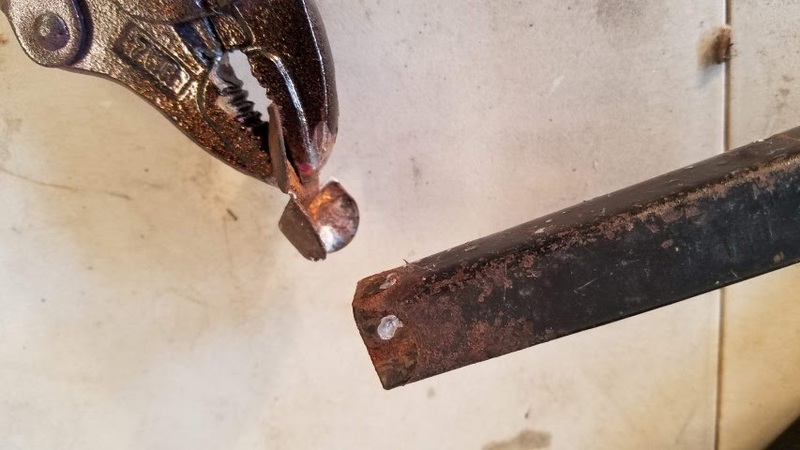 Since one of our tips is missing, it keeps the table from sitting level, so we're going to remove all the metal tips, which will not matter once we replace them with the rubber ones. If your tips are like ours and in need of replacement, please take great care when using tools to pry and pull as we demonstrate below. Wear gloves to lessen the risk of poking yourself with an errant tool. That said, if you're up to the task, remove the tips if necessary. Prying the metal tip away from the leg. 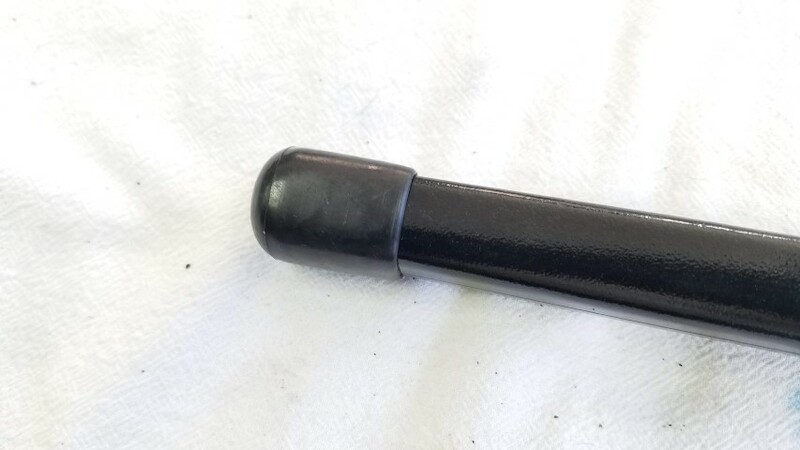 The tip has a light spot of welding holding it in place. 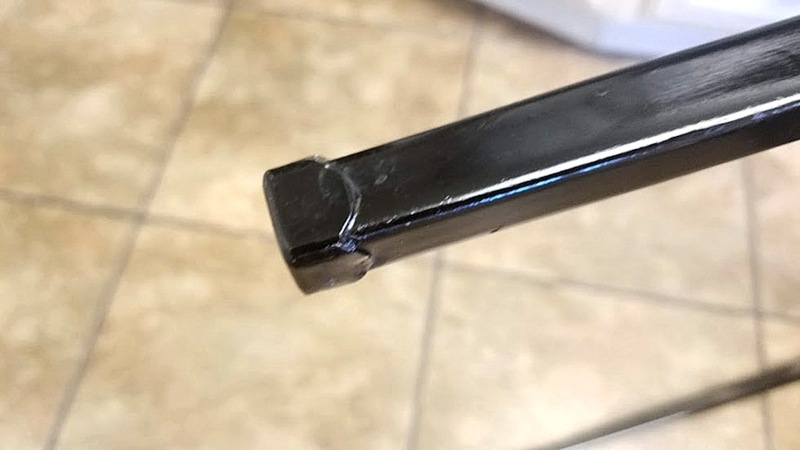 Our vice-grips allow us to break the tip away easily. 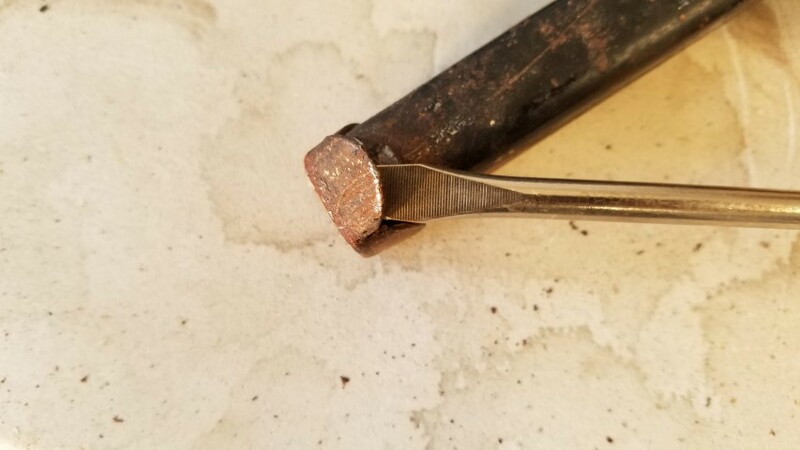 If you remove the tips as we did, and you find that sharp edges remain from the broken spot welding, file it smooth. 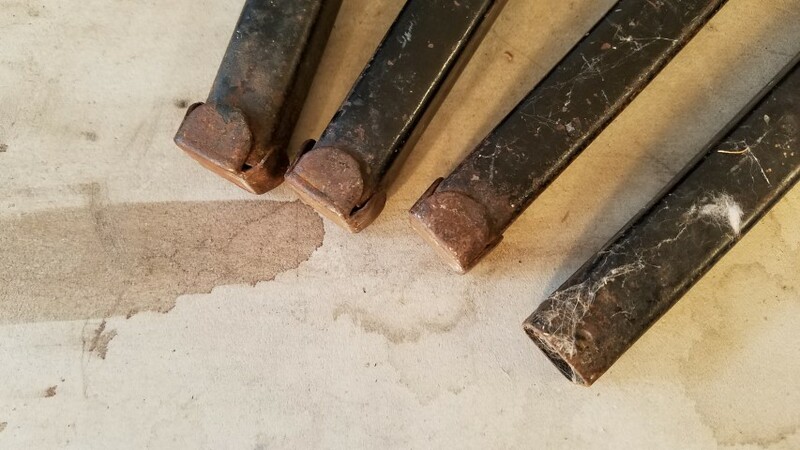 If the tips on your table legs are in good condition, as shown below, you may choose to add rubber/vinyl chair leg tips. A leg tip in good condition. Since we are going to repaint all the black metal portions of our table, they must be removed. Each is held in place by screws. 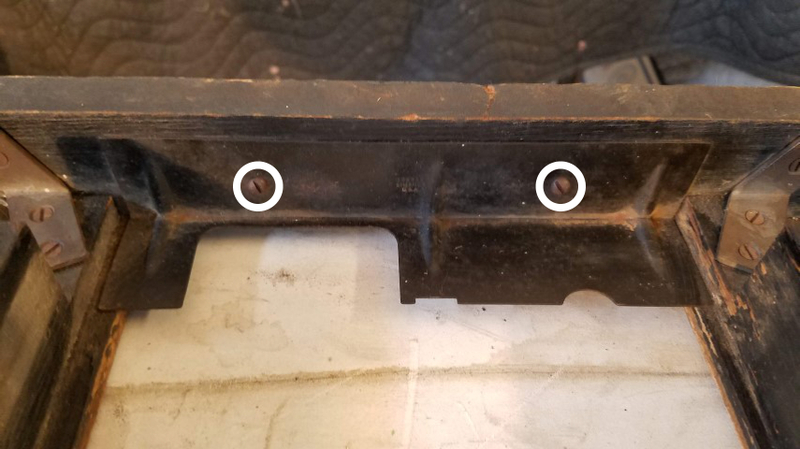 If you wish to remove yours, you can take photographs of each part in place prior to removal if you are fearful that you won't recall how to reposition the parts for reassembly. Four screws hold these brackets in place. They are easily removed. Make note of the correct four screws, or bag them with a label, so that you use the correct screws during reassembly. Two screws hold this L-angled panel in place. They are easily removed. Make note of the correct two screws, or bag them with a label, so that you use the correct screws during reassembly. Removed components which will be repainted. Inspect the bottom of the corners of your table top. If you find metal wood joiners protruding as shown in the image below, gently tap them back into place with a hammer. 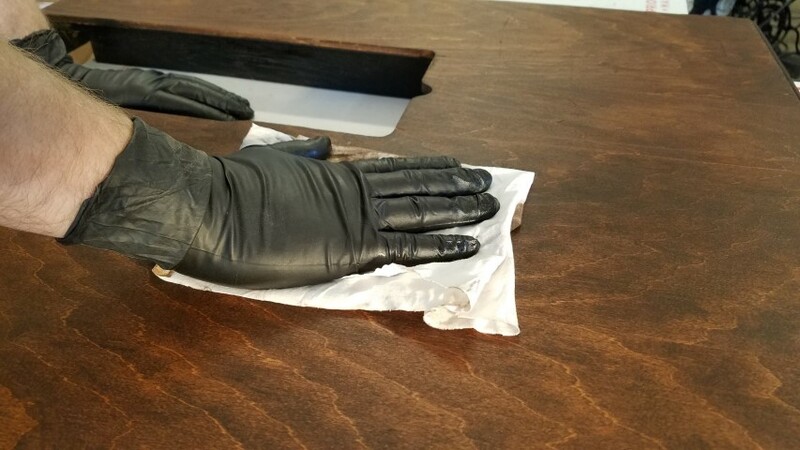 This will avoid injuries to fingers when handling the table, and will also firm up the corners. Gently tap a protruding wood joiner back into place. This can help even the positioning of joining corners as well. Our table has small areas of missing veneer, and some light gouges and scratches. We do not expect to create a "like new" surface. To do so would require a lot of wood filling that would not stain evenly, or replacement of the veneer with new veneer or laminate. If you wish to use new veneer or laminate, that is beyond the scope here, and you can find plenty of tutorials on YouTube when you search "install wood veneer." Replacing your veneer would certainly result in a beautiful finished product. You just have to decide if that level of refinishing is appropriate for you. If you choose to use wood filler in any deep scratches or gouges, be advised that even though wood filler will accept stain, there may be an obvious visual difference between the original wood surface and the wood-filled areas. Our choice is to sand the wood veneer to ultimately create a nicely refinished, albeit "less than perfect," surface. 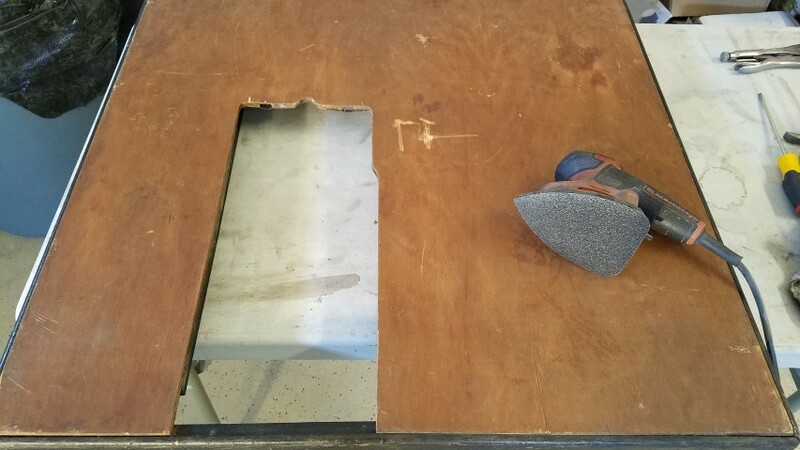 You can sand your table by hand, but depending on it's condition it might be exhausting work. A mouse-style electric sander will make the task much easier. An electric sander can be purchased for less than $30 if you cannot borrow one from a friend. At a minimum, we recommend sanding first with 120 grit, then finishing with 220. You could also start with 80 grit, but don't cut too deep into the wood veneer with the 80 grit. We start with 80 grit. You absolutely should finish with the 220. Using an electric mouse-style sander to smooth the wood veneer and prepare it for re-staining. PRIOR TO SANDING: If you have areas of veneer that are peeling up and threatening to break off, you can use wood glue to secure them. Glue must be applied, followed by firm pressure. Glue will squeeze out from the repair area, and that glue should be wiped away with a damp cloth before it dries. 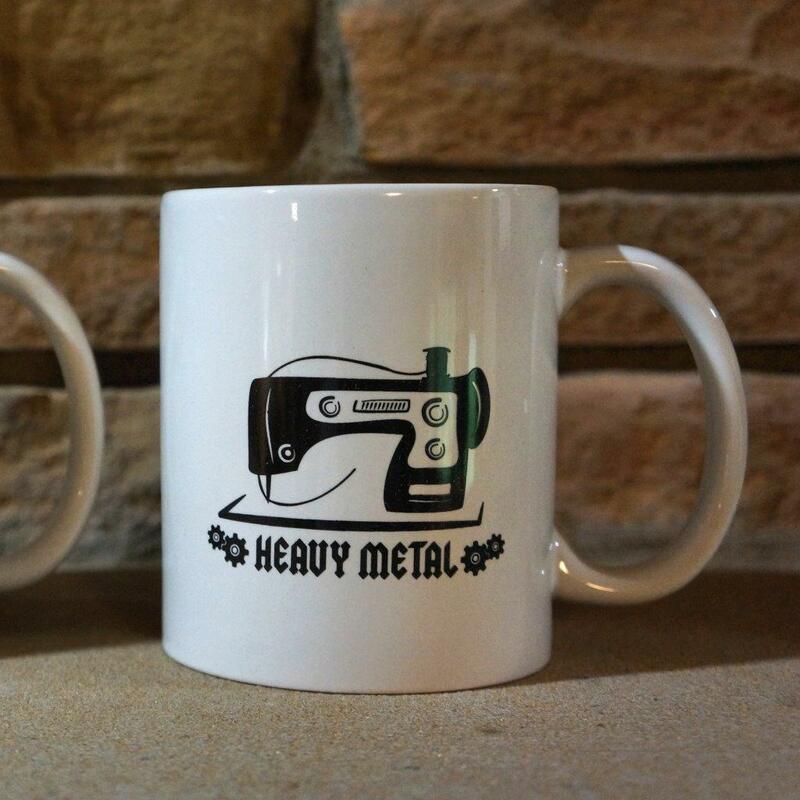 Maintain firm pressure on the area using a heavy object. You can use small clamps if the area is near the edges of the table. 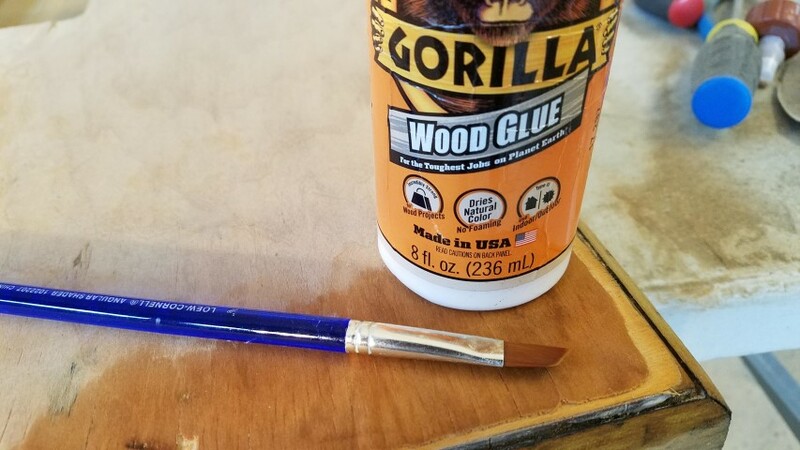 Wood glue can be "forced" under loose veneer using a small brush. Notice the edge of our veneer is long gone in this area. This condition may prompt you to install new veneer, but research the process to make sure it's right for you and your expectation. You must glue the veneer into place reasonably well. But you can bear in mind that the edges will be further sealed by our final acrylic coating that follows stain. 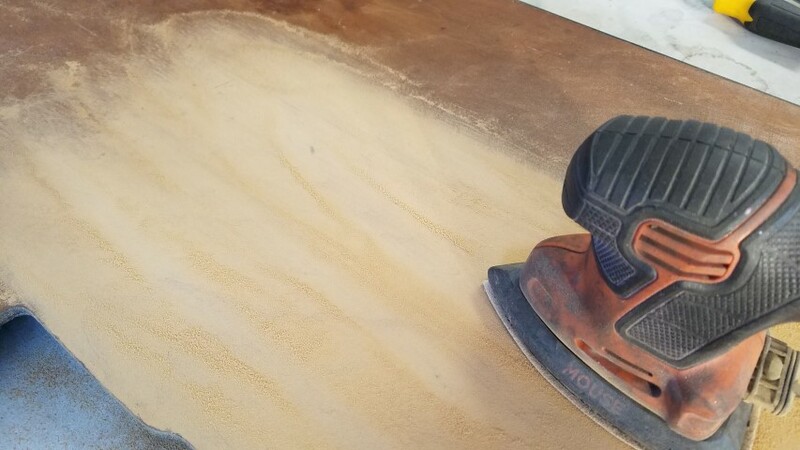 If your table edges require refinishing, sand them as well. 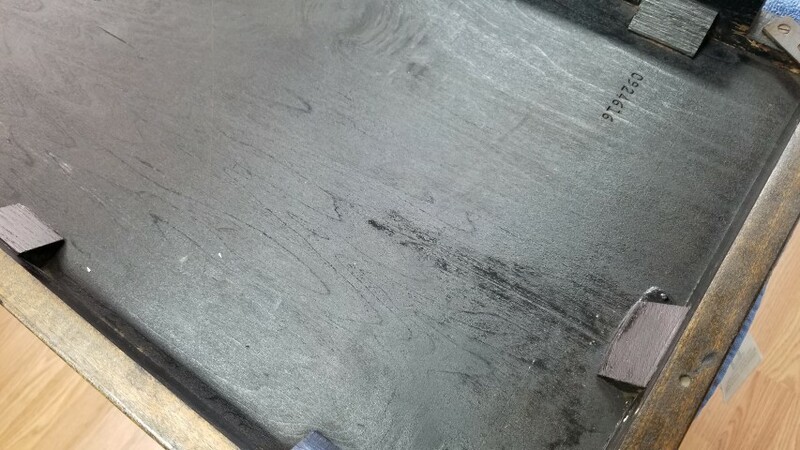 In our experience, the black finish can be sanded away and does not require chemical stripping. Prior to beginning the staining process, wipe the table clean with a slightly damp cloth. Invert your table top and clean the bottom thoroughly. If you use a damp cloth, allow the moisture to dry. Make sure the underside of your table is clean. Notice above that the underside of our table is clean, and the edges of the table have been sanded. The table originally had black painted edges and a painted underside. We chose to use ebony stain to freshen the appearance of the bottom and to stain the edges of the table. You may decide it is unnecessary to do anything to the underside of your table. You might choose to paint the edges and the underside of your table with black latex paint and a brush, but be aware that lesser quality paints can show brush marks - apply a quality paint in thin coats with a quality brush for a nice finish. Actual furniture paint, such as Valspar Furniture Latex Paint is more likely to provide a smooth finish, but it is expensive compared to standard black latex paint. 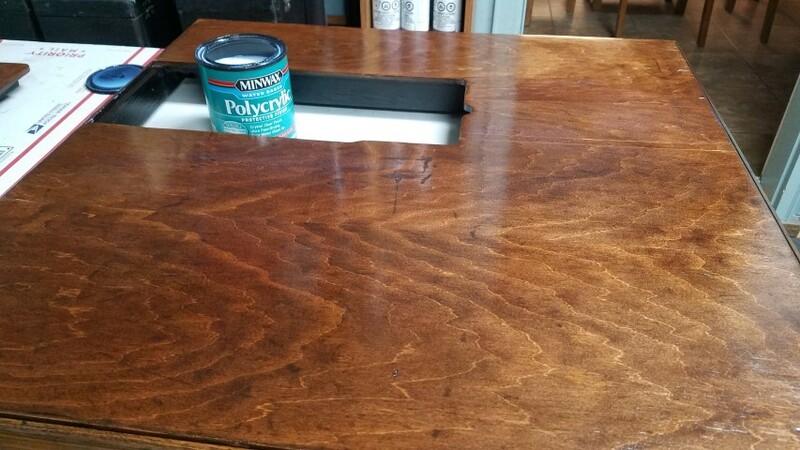 If you really want to do your best to match the original appearance of your Featherweight table, the Valspar in satin finish is a great option. Meanwhile, we're keeping things simpler by using the ebony stain on the edges and underside of the table. (We will apply a honey-colored stain to the top later.) We apply stain to the underside with a foam brush as it allows us to get into crevices (you could use a standard brush). 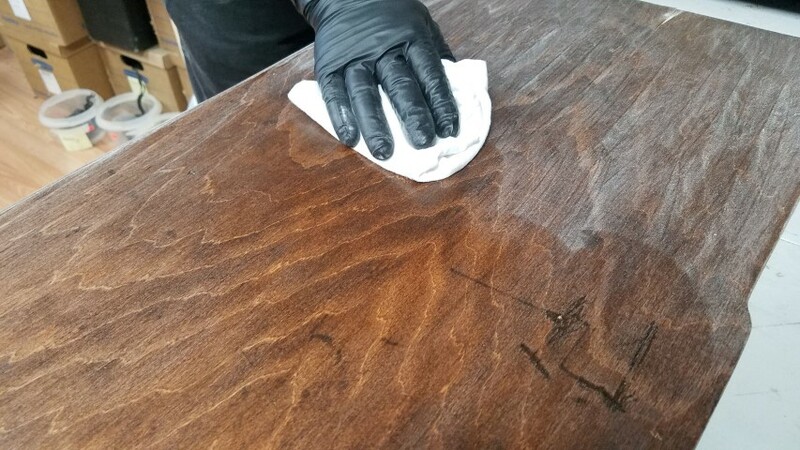 We allow a couple of minutes for the stain to penetrate the wood thoroughly, then we rub the excess stain away vigorously with a clean cotton cloth. When staining, do not allow stain to lay on the surface like paint. Excess stain must be removed. 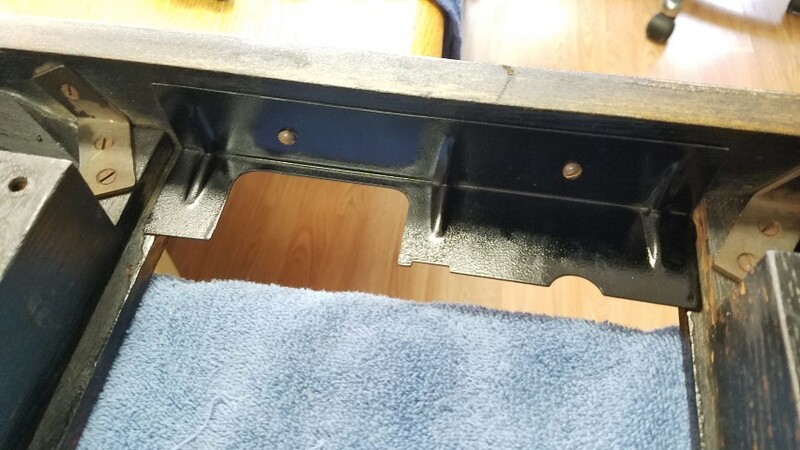 This process is not going to give the underside of the table a "new" finish; rather, it is going to even out the old black finish to give it a refreshed appearance. 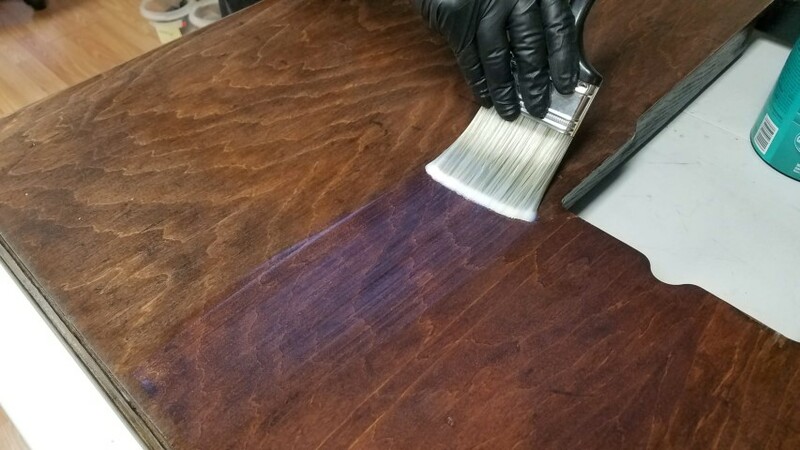 Using ebony stain to "refresh" the appearance of the table's underside is easier and faster than repainting. A simply "refreshed" appearance is likely all that is merited on the underside of most tables. Painting the underside of your table adds material, effort, etc. for little if any benefit, but you should decide on what will please you. 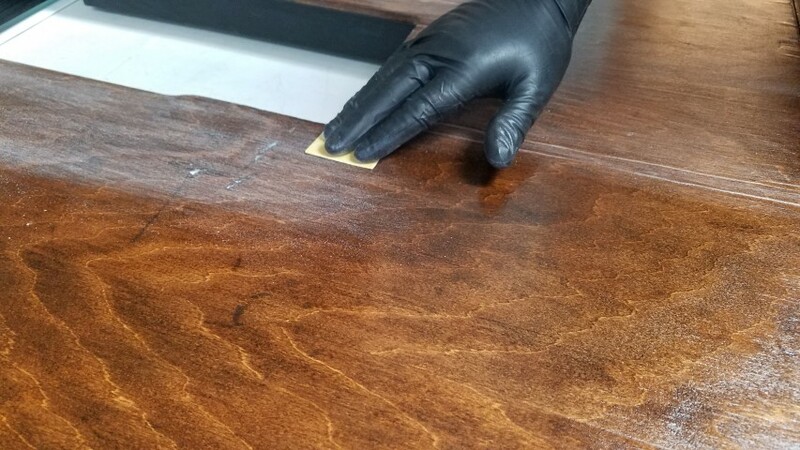 On the table edges, our black ebony stain will not recreate the original black painted appearance on the Featherweight table, but a stain will allow the wood grain to show, and will be more durable against the appearance of nicks than a painted surface. The final effect will be similar to the original table in that the top will be a lighter, natural wood color, while the edges will be stained ebony - a darker, less natural color for wood, creating a two-tone effect that coordinates well with the glossy black legs. Read the instructions on your stain. Don't complicate stain application - it's very easy with Minwax products in our experience. Gel-stain is overkill for a project like this. Minwax is available in small 8 ounce (half pint) cans in some stores and online - enough for this project. NOTE: There are other methods for treating wood surfaces, such as oils. Please rely on YouTube tutorials or the advice of knowledgeable resources regarding alternatives to stain. Meanwhile, our method here is particularly easy, and you can choose various stain colors. 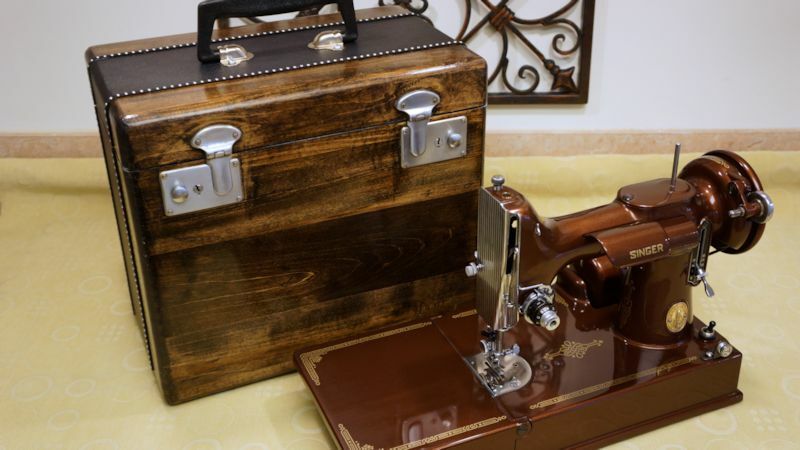 The wood veneers on vintage Singer products accept stain quickly and easily when they have been properly sanded. Stain isn't applied like a "coat of paint." Multiple coats for many wood colors are simply not needed. Staining the surface of this table required mere minutes. We wipe on the stain, and immediately wipe away excess. If you find that your application appears uneven (light and dark areas), simply reapply stain and try using circular motions to get the stain to penetrate evenly. We chose Minwax Honey stain for our table top. 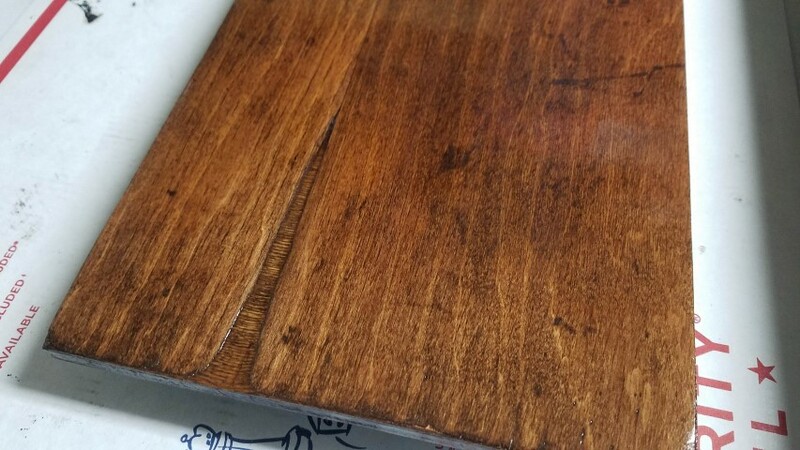 Experience has taught us that the honey color does well to even the finish on old wood that might have water stains and discolored areas that do not vanish with sanding, whereas a lighter or more "natural wood" color won't hide imperfections as well. Of course, you may choose a different stain color. We also do not find that a pre-stain wood conditioner is necessary when staining the veneer on vintage Singer products. We've compared the results in the past, conditioner versus no conditioner, and the final results were the same using the methods we describe here. The sanded veneer (finished with 220 grit and wiped clean with a damp cloth), will accept stain easily with quick saturation of color. A single coat is all we've ever required of this color stain on most wood. In this case, rubbing it on with a rag works very well. Rub it into the wood, ensuring an even application of color, then wipe away all excess. Rubbing the stain in the wood veneer. Wiping away excess stain with a clean, dry cloth. Allow the stain to dry per label instructions prior to applying your top coat. 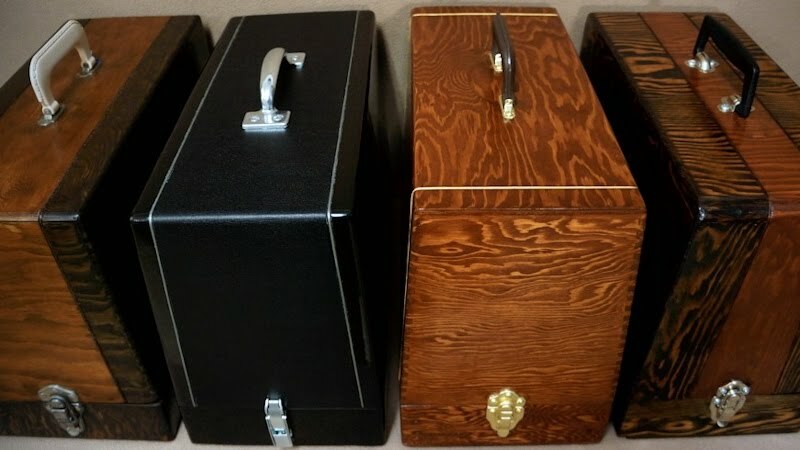 As this is a tutorial for hobbyists, and the idea is to offer a project that can be accomplished in a weekend, I strongly recommend Minwax Polycrylic Protective Finish. It applies easily and cleans up with water. 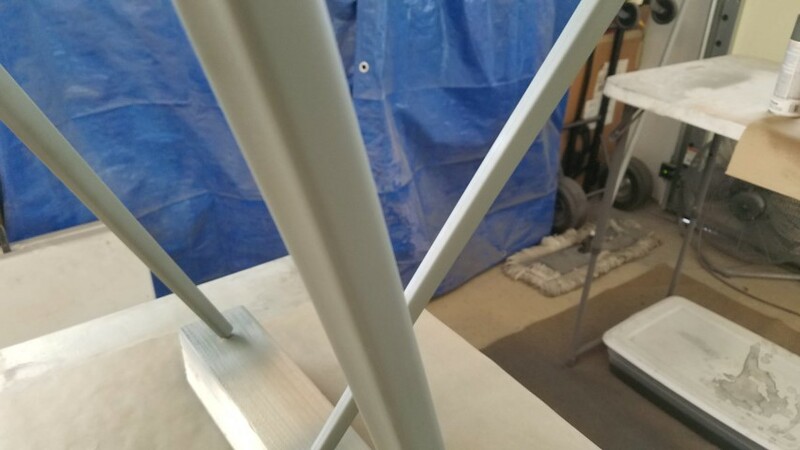 My favorite benefit is that it dries quickly, because the secret to a smooth finish with "poly-type" top coats is to apply three coats with light sanding after the first and second coat. With the quick drying time, you can achieve three coats easily within 8 hours. I would suggest that you not be tempted by spray-on products unless you are very comfortable achieving an even finish with a transparent spray across a broad surface. I would also suggest that you not be tempted by products which claim to be both the stain and the poly-coating in one step. I've tried them all, and what I'm demonstrating here is the easiest way for a hobbyist to achieve a nice finish without hassle. In my experience, there are "tricks" to getting those other products to finish well in spite of their claims of "ease," while our method here is practically "dummy proof." Please don't be tempted to apply the Polycrylic with a foam brush. A standard stain brush works much better. You can choose from the following finishes: gloss, semi-gloss, satin, matte. If uncertain if you want a satin or gloss finish, you will likely find the semi-gloss appealing and close to the original. It can then be given a higher gloss finish by using furniture polish or Howard's Feed-N-Wax Wood Polish & Conditioner. Keep in mind that when applying your top coat finish, you want to avoid dust settling onto the wet surface. You don't want to do this work in an area where dust and debris are drifting in the air excessively. Our preferred product. 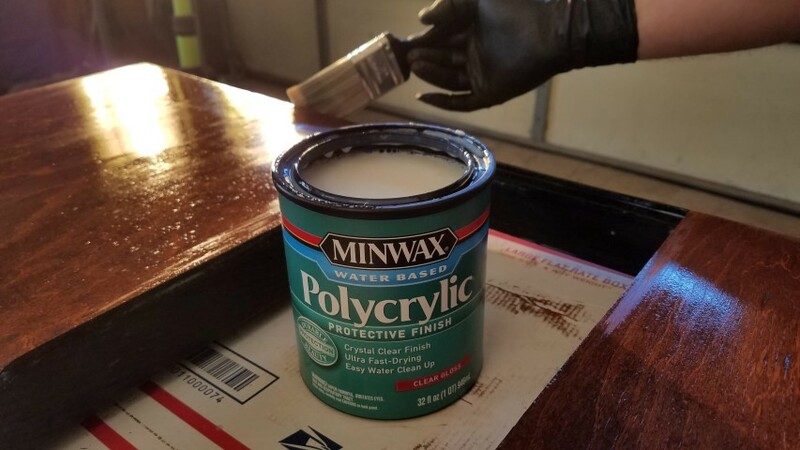 Minwax Polycrylic Protective Finish. We chose gloss for this project. Apply with a decent brush. Lightly sand with 220 grit, evenly with the grain of the wood. Wipe surface clean with a damp cloth; allow to dry. Apply a second coat of Minwax Polycrylic Protective Finish. When you apply your third and final coat and allow it to dry, you will be finished. You need not sand the final coat. The Polycrylic product can appear milky as it is applied. Don't worry. It dries clear. 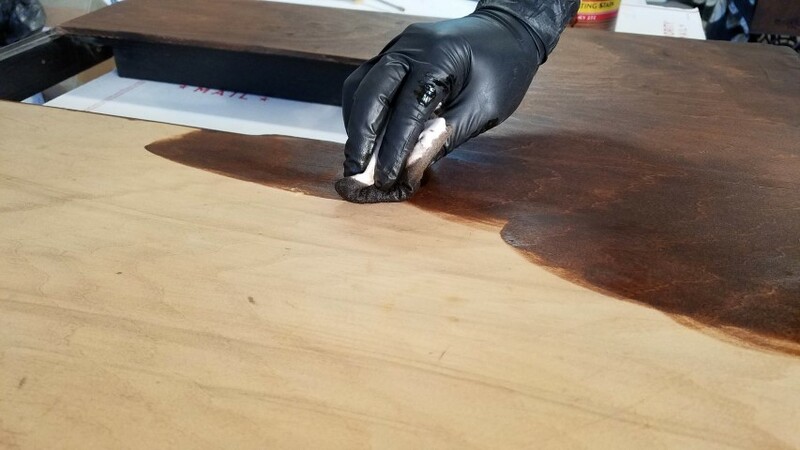 While applying stain is almost "dummy proof" as discussed earlier, brushing on your Polycrylic finish can require just a little finesse, but don't worry. You can handle this. The trick is to apply this Polycrylic finish in coats that are only heavy enough to remain wet as you stroke your brush across the full length of the surface. While a high-quality brush typically results in a better application by a professional's standards, I prefer a mid-grade, stiffer brush for this particular product because I want to ensure that I can pull the product across the surface heavily enough that it remains wet from end to end. This doesn't mean that you will dip your brush into the product, then stroke once across the full length of the table surface, and you certainly do not want to attempt to cover the entire surface at once. That would likely leave product too heavy in some spots, too thin in others. Rather, you will dip your brush into the product more than once for length-wise coverage, working in a section about the width of your brush across the full length of the table. Get a brush-width strip of wet surface applied, then lightly run your brush across the full length, "end to end" to finish that section. This should all occur briskly, and each section will overlap slightly. There are many tutorials on YouTube for applying this top coat. This one shows the brushing technique very well. Brush your stain onto the wood surface in the direction of the wood grain. The dotted lines illustrate that you will brush across the length of the surface section by section using the width of the brush. The sections will overlap slightly. The quick drying nature of Polycrylic means that your initial coat might have "dry spots" in it. 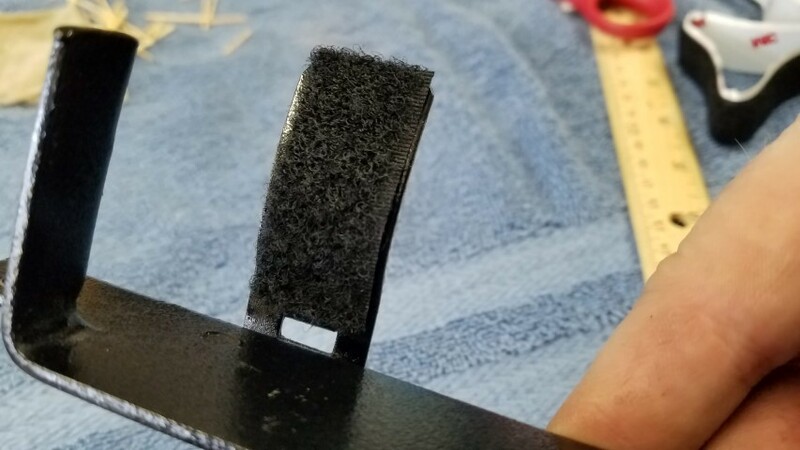 This is why you want to achieve that "end to end" wet finish, to avoid dry spots. But don't worry if that first coat dries and has some dull spots where it's apparent that your coating was thin. This will be corrected with the following two coats. When I mentioned that this requires a little finesse, I mainly meant that the quick-drying nature of Polycrylic means that if you re-brush the surface too much, you can inadvertently create thin spots because your brush will sort of "pull" the product back off of the surface, because it's fast-drying formula makes it tacky very quickly. Fear not, OK? Because your multiple coats will help correct any thin areas. If you notice that you have created thin or dry spots by brushing too much on an area, leave them and let your next coat compensate. WHY SAND BETWEEN COATS? If you've never done this sort of thing, the effect you achieve by sanding between coats might blow your mind (in a good way). I'll explain: after your first coat has dried, rub your bare hand across the surface lightly. You may feel slightly rough areas, which will be sanded away. After your second coat, you'll feel even fewer "gritty" imperfections in your finish, which will be sanded away. Following your third coat, you're going to be very impressed with your final finish. After a coat dries, lightly sand the surface in the direction of the grain with 220 grit per the instructions on the Minwax label. You will sand after the first and second coats. You will not sand after the third coat. Sanding between coats of Polycrylic. Light pressure in the direction of the wood grain. The entire surface lightly sanded. Use a slightly dampened cloth to clean away the dust caused by sanding. Allow moisture to dry. When brushing on your second and third coats, try to maintain that "end to end" wet brush stroke. By the time you have completed your third coat, you will likely have a nice, even finish. The third coat is permitted to dry. Remember our discussion of missing veneer sections? Below is our small panel that fills the cutout when a Featherweight is not placed in the table. Notice the damaged area. While it is far from perfect, it is less offensive now that it has been sanded, stained, and coated with the Polycrylic – the top coat has created a "smooth to the touch" surface in spite of the divot. Had we filled that large divot with wood filler and sanded it level, we would have achieved a level surface, true. But in our experience using even the best name brand fillers, the stain color achieved would not have been a good enough match cosmetically. If you disagree or you want to try colored wood fillers, knock yourself out and we hope you get excellent results. 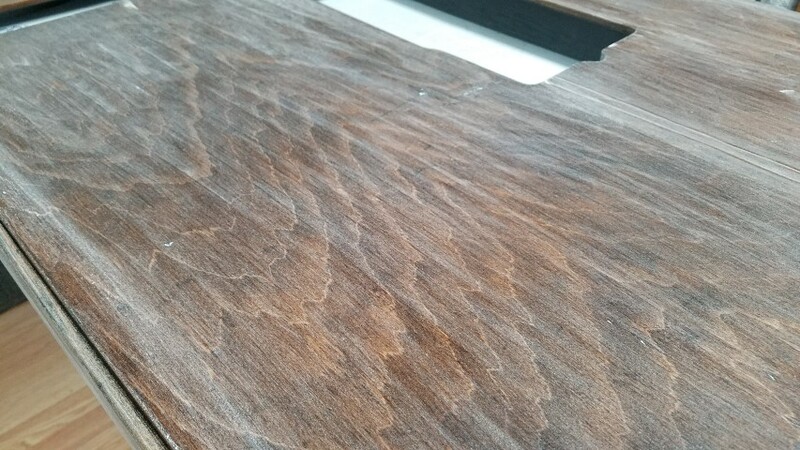 If your table surface has excessive areas of missing veneer, you might want to consider trying to replace the veneer, but please research the process thoroughly, and better yet, find a friend who has some experience with it. The damaged area (left of center), stained and coated with Polycrylic, is more tolerable to the eye. 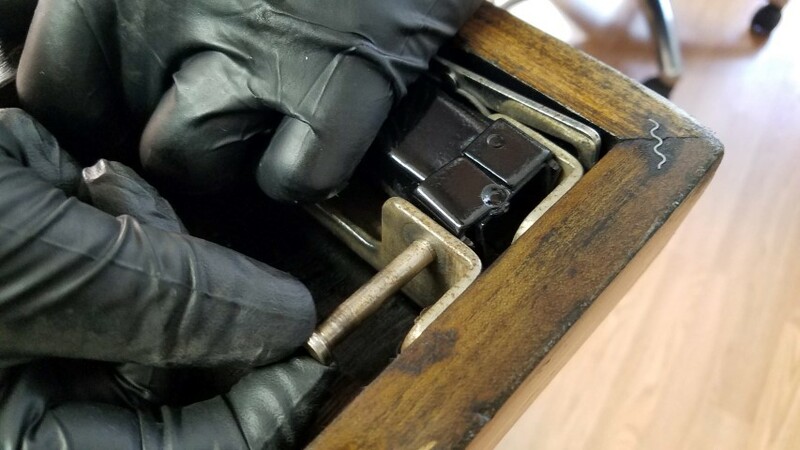 If your table has the silver hinges and they are corroded, you may wish to clean and polish the visible areas - particularly the portion of the hinging stabilizer that will be visible when the table is set up. The circled area will be visible when the table is in use. Not everyone will have comparable tools available. 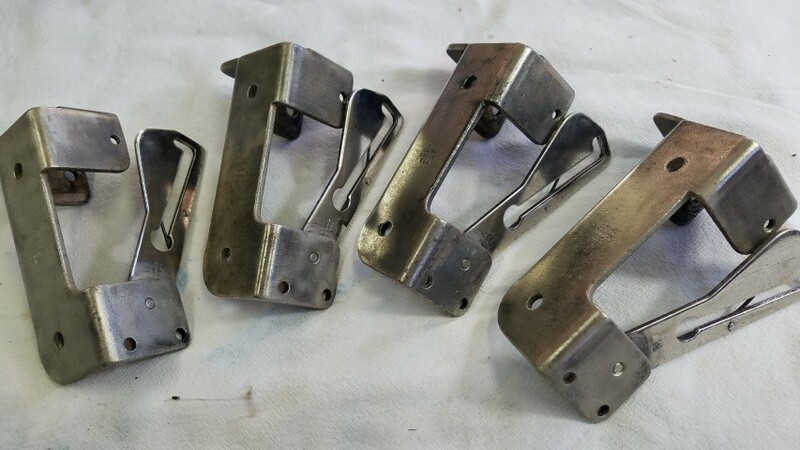 You have a few options as to how to clean and polish these bracket/hinges. 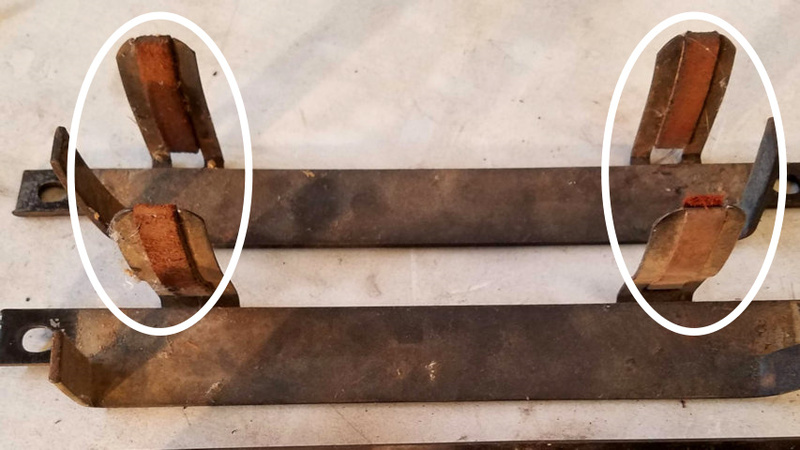 You could remove rust with an easy-to-use product like Evapo-Rust. 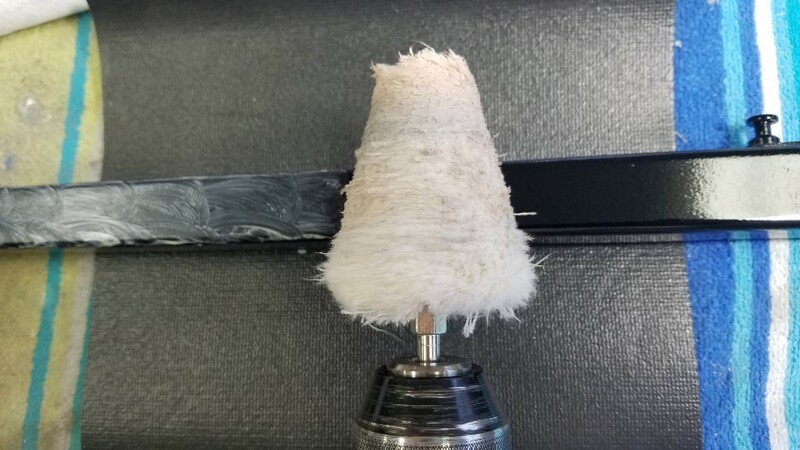 You could use a small wire brush and concentrate on the areas that are most important cosmetically. These hinges could be blasted with an abrasive. Or you might simply wash them with a mild solvent. 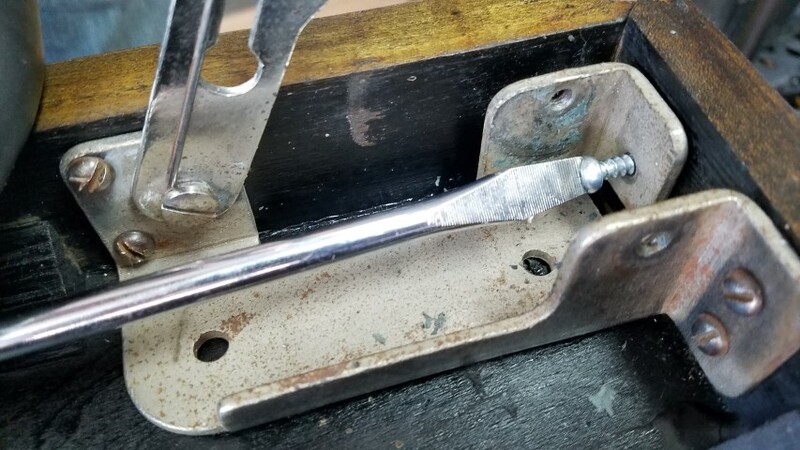 Once the bracket/hinges are cleaned to your satisfaction, you can then polish that visible portion of the stabilizer using a rotary tool (like a Dremel) or a bench-mounted power buffing wheel. You could also spray paint the hinges, although their movement will make the sliding area susceptible to some scuffing (maybe not a big deal). Of course, you can forgo any refurbishment beyond cleaning them. 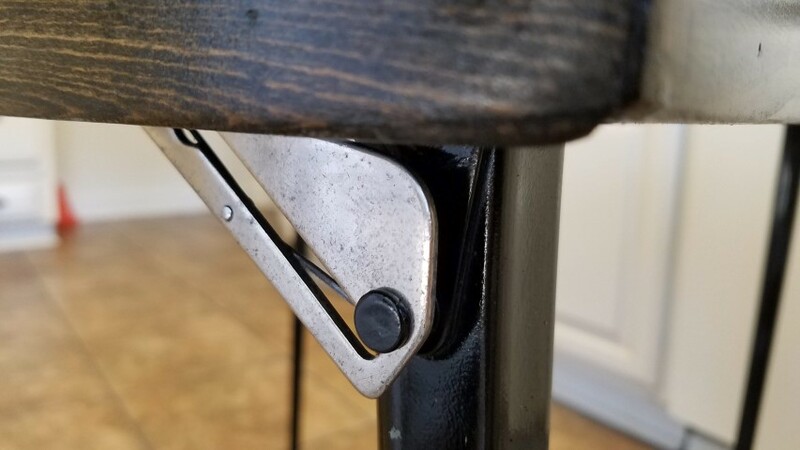 We have polished our brackets with particular care on the hinge stabilizer that will be visible when the table is in use. Hopefully your table's legs are in nice condition. But if they are like ours, they will benefit from being repainted. 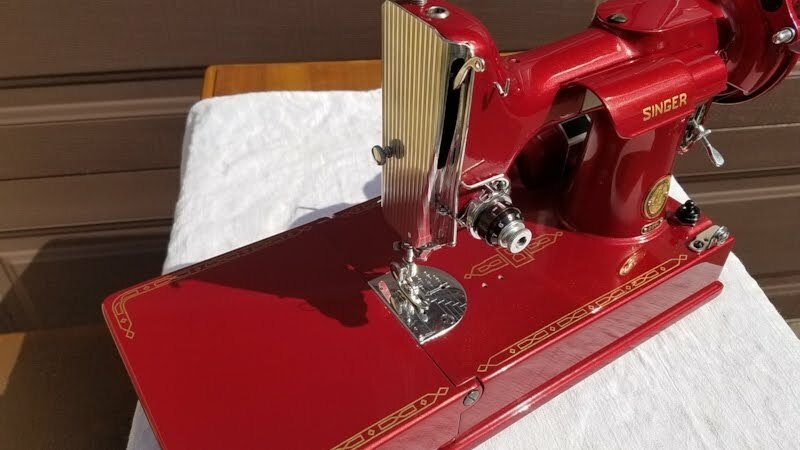 We're at an advantage, of course, in that we do a lot of painting when we refinish Featherweights and other vintage sewing machines, but you can use aerosol products to achieve a terrific finish on your table legs to rival the original factory appearance. We start by sanding the legs to get them smooth and free of rust. Our legs have been sanded with 220 grit. One way to position your legs for priming and painting. You could also hang your table legs. 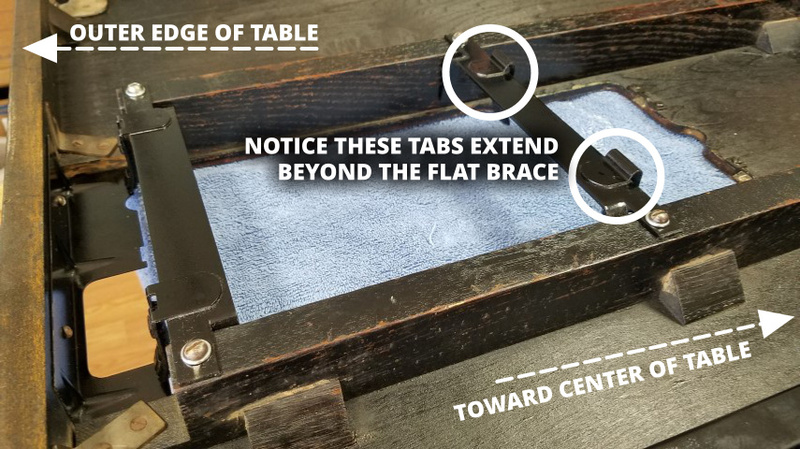 If you chose not to remove them from your table early in this tutorial, you can simply mask off your table top (and possibly your bracket/hinges with tape and paper). There are good aerosol paints that claim to be primer and paint in one product. I would be apt to trust both Krylon and Rustoleum products. I would recommend choosing a product with a fast dry time so that your project doesn't drag out unnecessarily. 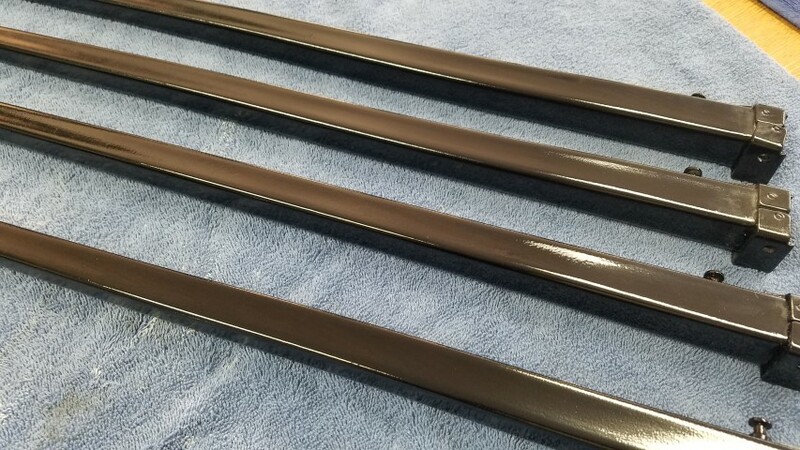 You can choose a gloss black spray paint, coat your table legs, allow them to dry, and be done with it. 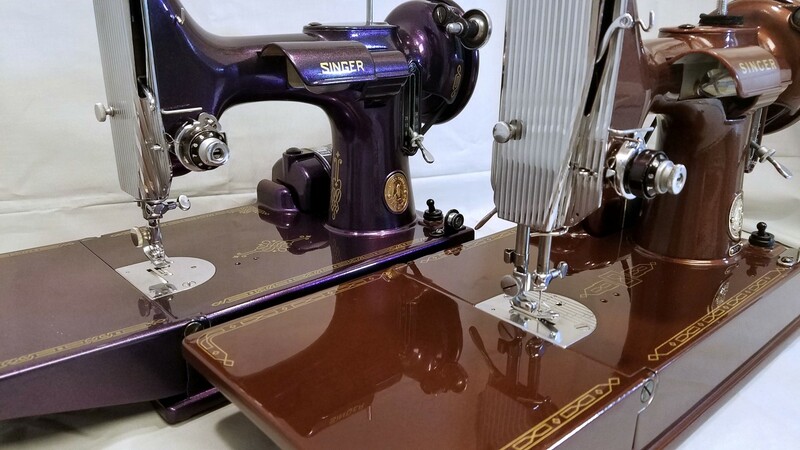 At Still Stitching, we're in the business of putting lasting finishes onto metal, so our approach is a bit more technical, and you could follow these steps as well if you want to be assured of a quality finish to rival the original factory application. Bare metal should be etched to ensure adhesion of the finish. 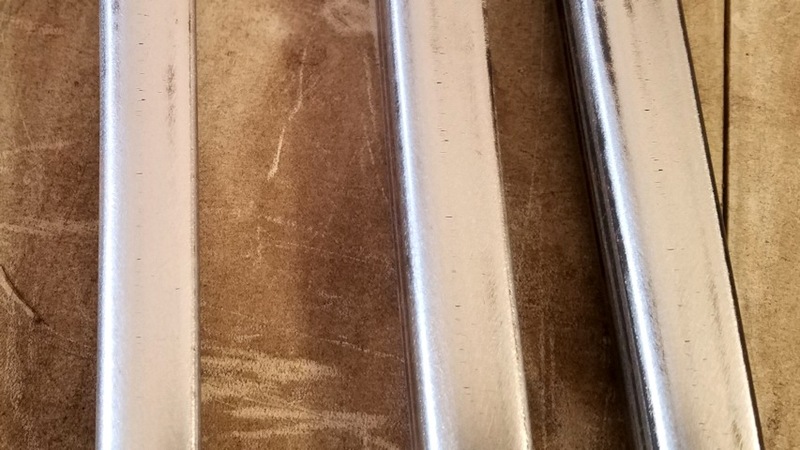 We primed our table legs with metal-etching primer. Rustoleum offers a good product in an aerosol can, as do numerous other brands. Our table legs coated with etching primer. Following the instructions on your primer and paint products, you will spray multiple light coats of each product to get the job done. We primed, painted, then applied a gloss coating as our paint product requires it. Your spray paint will likely offer a finish that does not require a top coat, but if you feel you want a protective top coat, I suggest you avoid a lacquer product and stick to acrylic enamel. 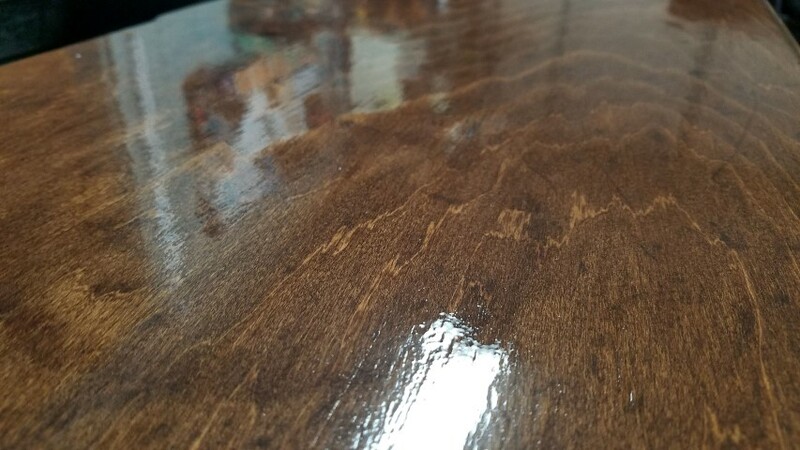 Rustoleum, Krylon, and other brands offer clear acrylic enamel top-coat sprays that, while not as durable as the gloss coating required on an automobile or industrial application, are adequate for your table legs. If you use one of these clear products, allow even more drying time than the manufacturer recommends prior to an expectation of full durability. 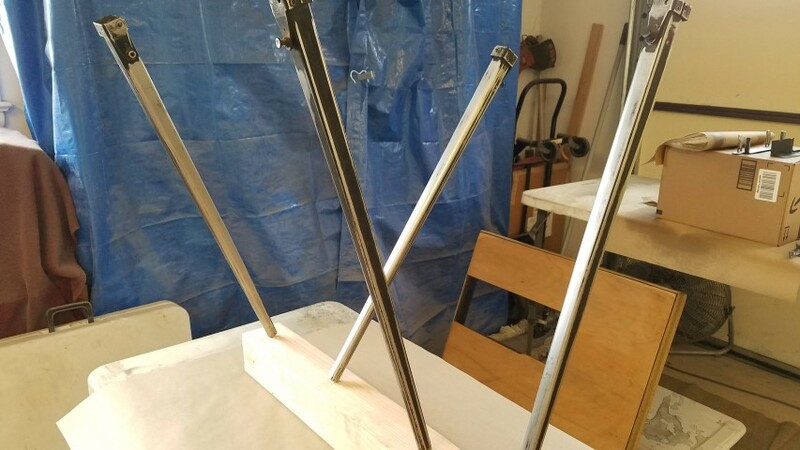 You can use your finished product per instructions, but for a truly hard-shell final finish, treat your table legs delicately and quadruple the drying time in low humidity. When you finish your legs and they have had ample dry time, you may wish to use a light automobile compound to polish them. This can increase luster and compensate for a less than perfect finish if your spraying technique wasn't ideal. The drill attachment you see in the photograph below can help with this task. Polishing our legs with a light compound. 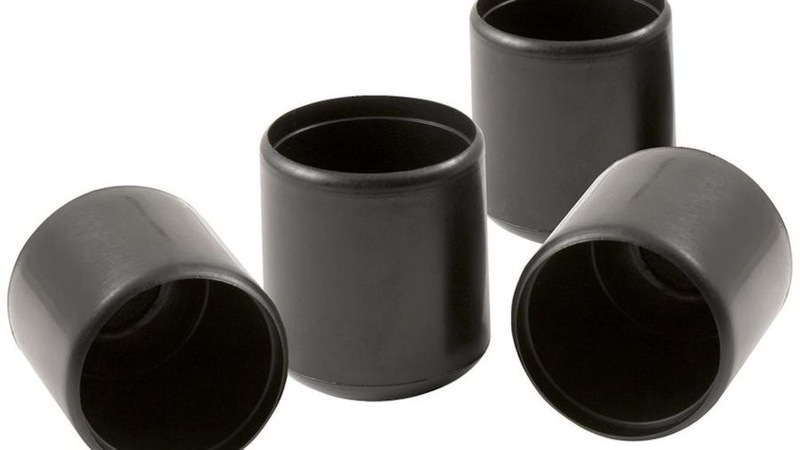 Rubber tips will protect carpet and flooring. 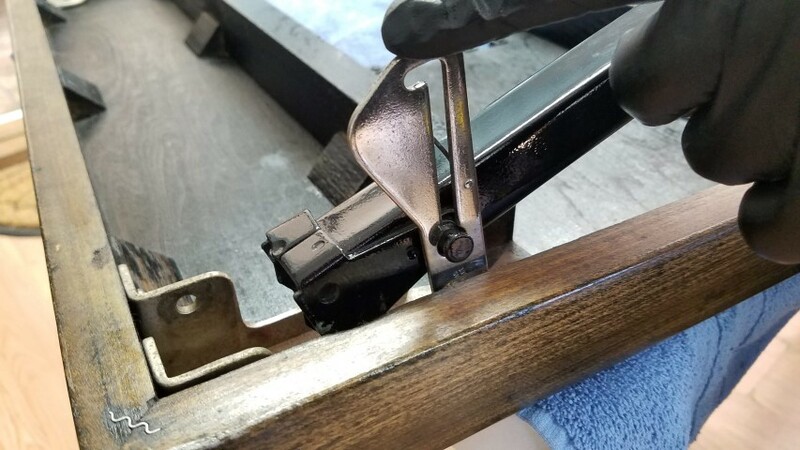 If your black metal parts that support the Featherweight in the table are also in need of paint, any rust must be removed and then the steps used for painting the legs should be applied to the additional metal parts. 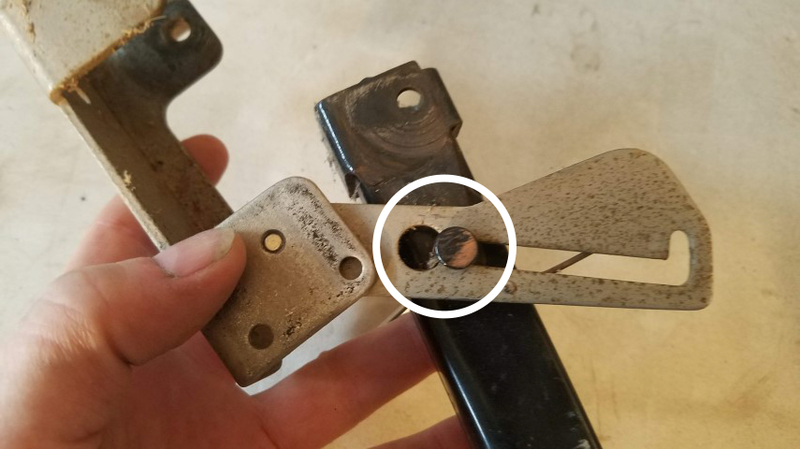 While it isn't necessary to functionality, you might wish to clean corrosion from your hinge pins and screw heads. We accomplished this with a wire wheel. You can also use Evapo-Rust followed by some polishing. 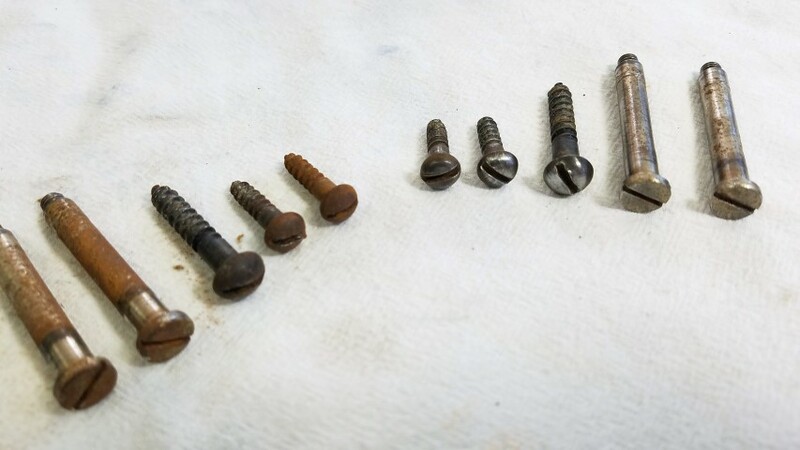 Left, corroded hinge pins and screw heads. On the right, cleaned with a wire wheel. Recall that our table had lived a hard life. Even with the screws firmly in place, we were concerned that the table would not be as sturdy as the day it was manufactured. 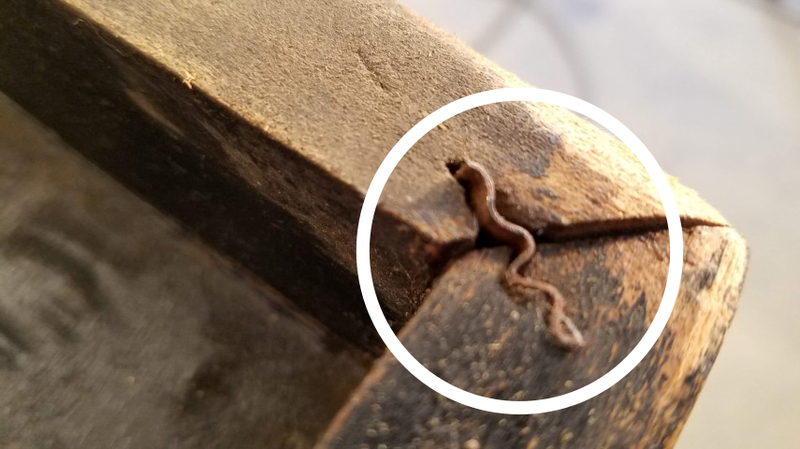 You probably know how screw holes in wood can become a bit oversized or "stripped out," which means the screw won't be made really tight. 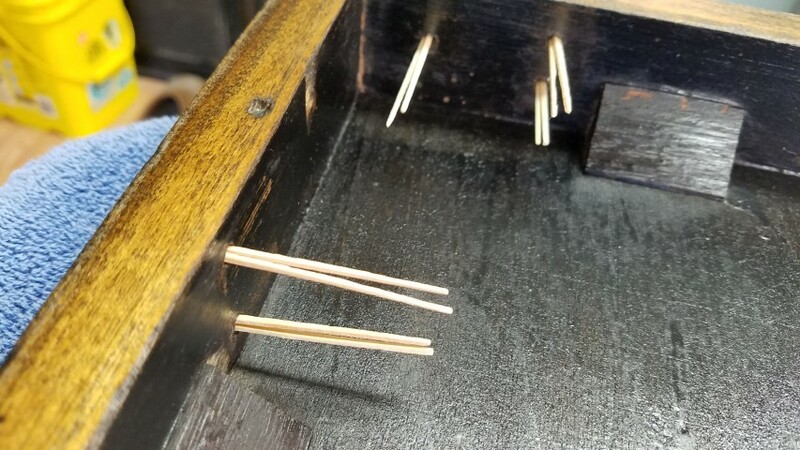 Don't worry if the toothpicks don't "crush" into place perfectly even with the surface. 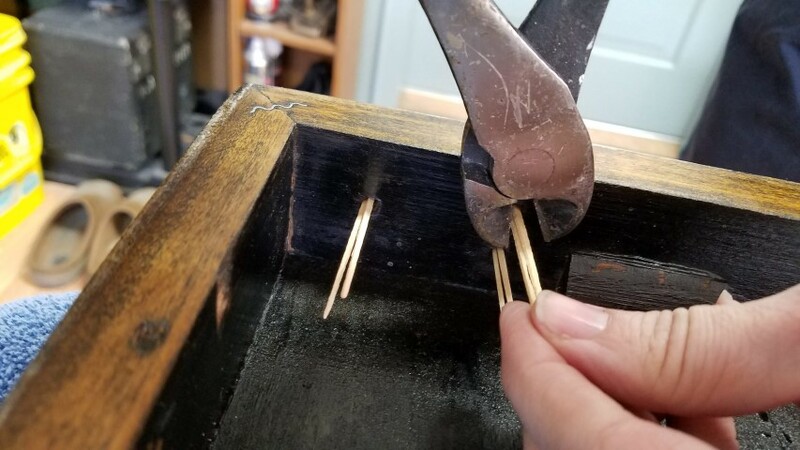 Screwing in your hardware will effectively crush the wood of the toothpicks further into place. It may be necessary to gently tap the hinge pins into place. The hinge pin will only slide in to meet the threaded area, then you must use a screwdriver. There are leather strips on the braces which hold the Featherweight into place when it is inserted into the table. These strips serve as padding so that the metal braces doesn't grind against the Featherweight's surface. Hopefully, yours are intact. 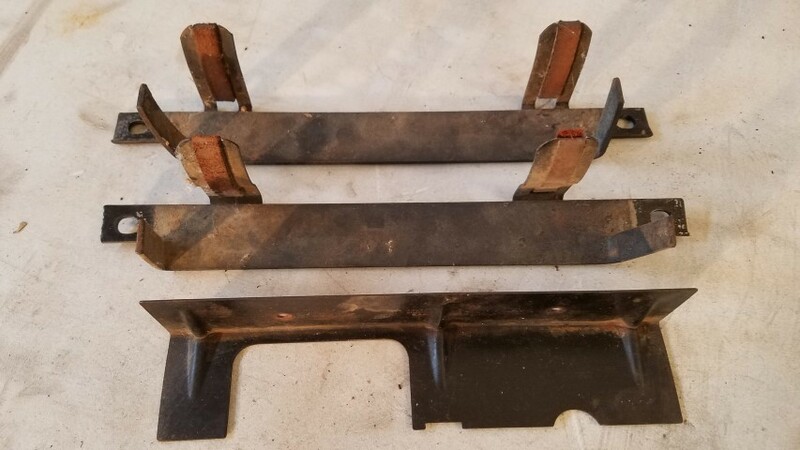 Two strips of padding severely worn (left), and two missing entirely (right). We removed those rotted strips prior to sanding and painting our braces. We then used the soft portion of adhesive velcro strips, cut to the correct length, to create padding where there used to be leather. 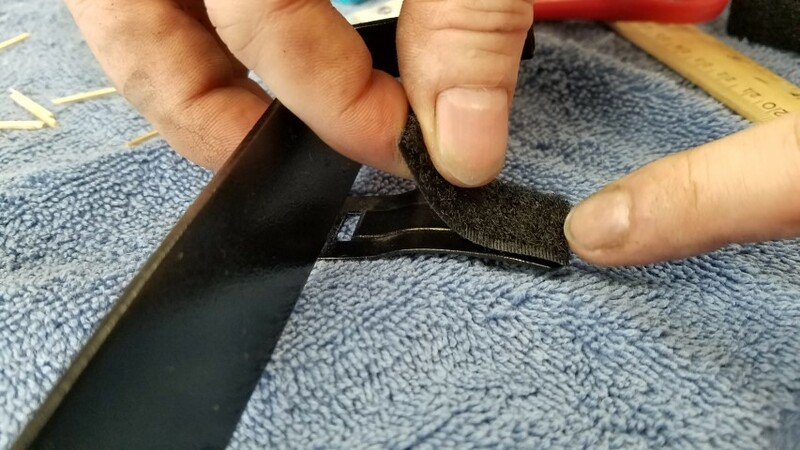 Using the soft side of an adhesive velcro strip to replace the rotted or missing leather padding. The adhesive glue on velcro strips is very strong and will serve us well. Notice the difference in the two braces - the tabs on the right brace (as shown above) extend further. Once fully reassembled, make certain that your table is stable before placing your Featherweight into it. The Featherweight table is a clever design that includes the center panel so that the table can be used in various ways. Our refinished table with a Featherweight we custom painted for Januari Rhodes. 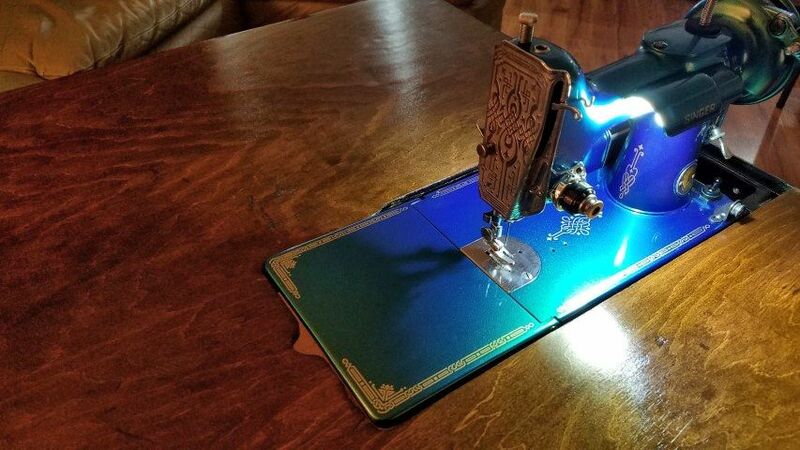 We love to see your projects, too! Follow us on Facebook and message us with your photos. Thank you for such a thorough tutorial and such clear pictures! 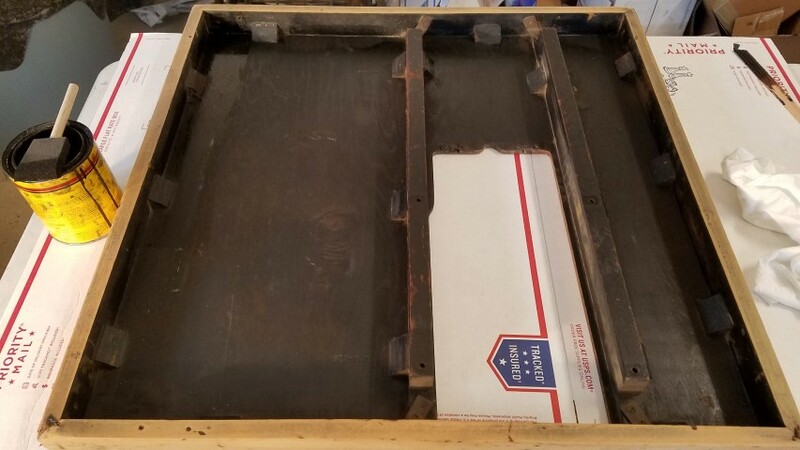 I recently bought a featherweight with a table and they are both in very rough shape. 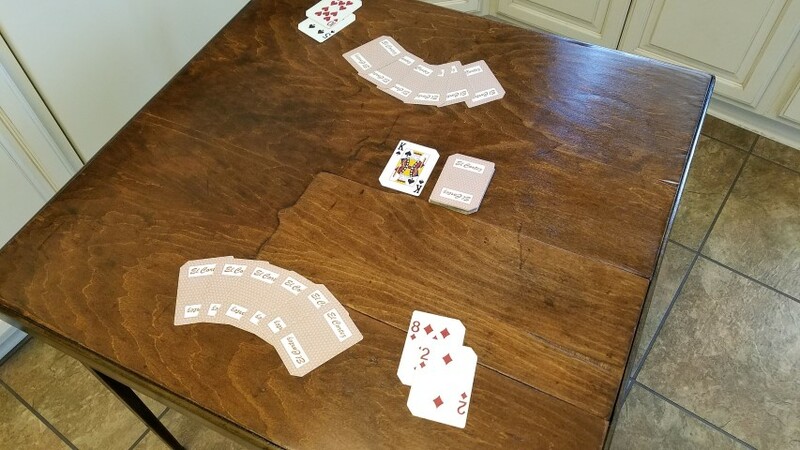 I wasn't sure what to do with the table but I am going to give this a try. I have about 3 to refinish. I thought I knew what I was going to do, but apparently not! Thanx for such a thorough tutorial on each little bit. This will certainly come in handy on my upcoming projects. 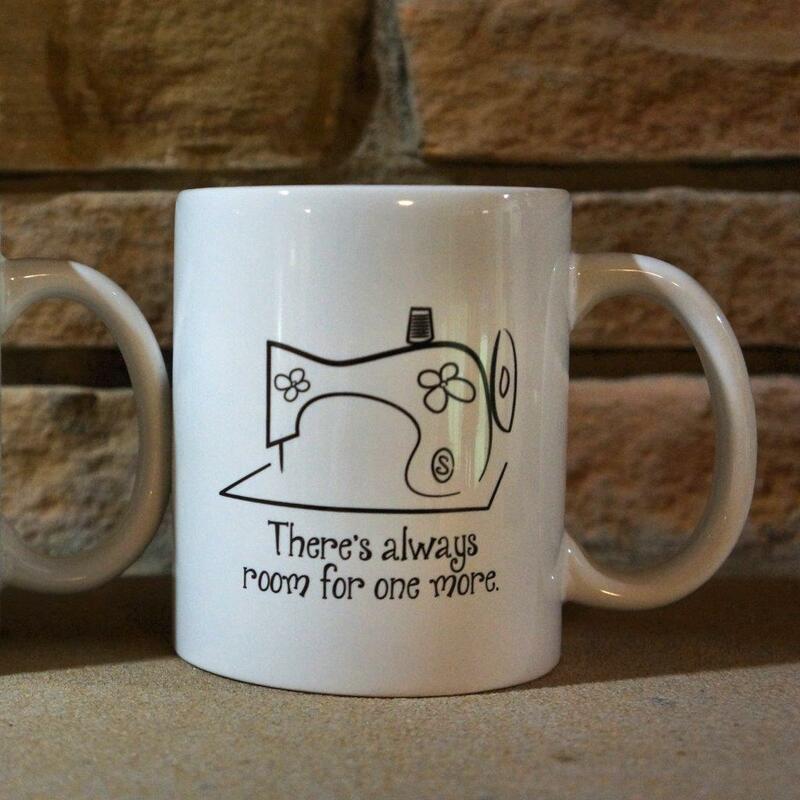 We produced the only feature-length documentary on vintage sewing machines. 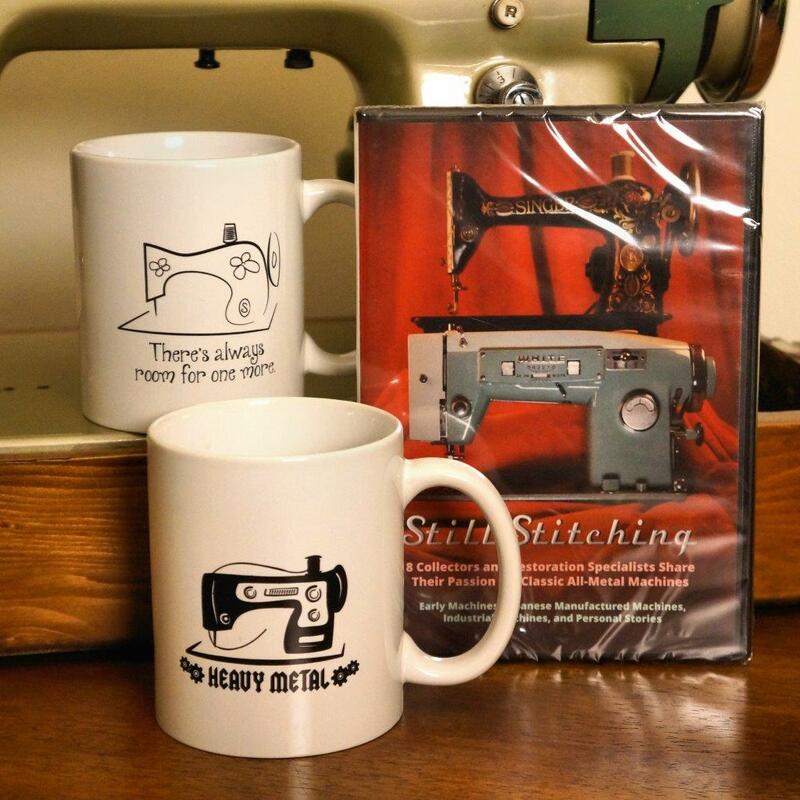 Still Stitching has delighted thousands of viewers and urged the expansion of many collections. Many viewers tell us they watch it repeatedly. Ladies tell us that the film helped draw their husbands into their passion for vintage machines. 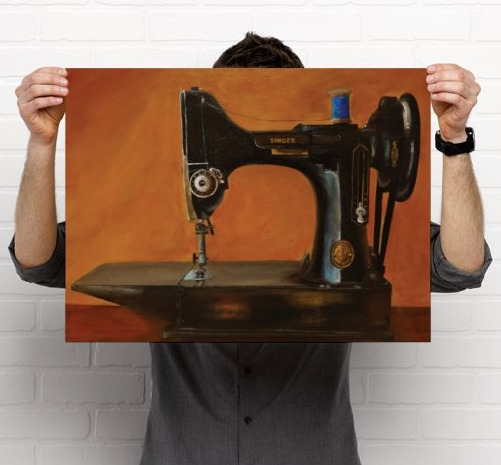 We are fortunate to assist many clients with procurement, high-end restoration, and custom painting of vintage sewing machines. 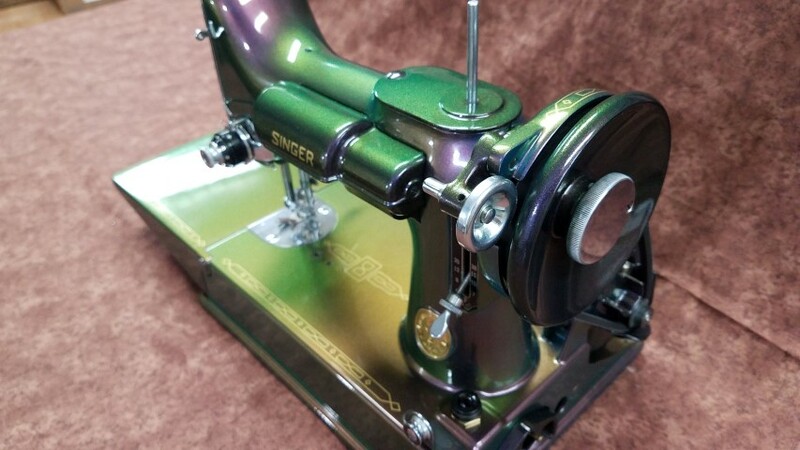 While Singer 221 Featherweights are the most frequently painted model, we paint many other models such as the Singer 15, 66, 99, 201, and 301. 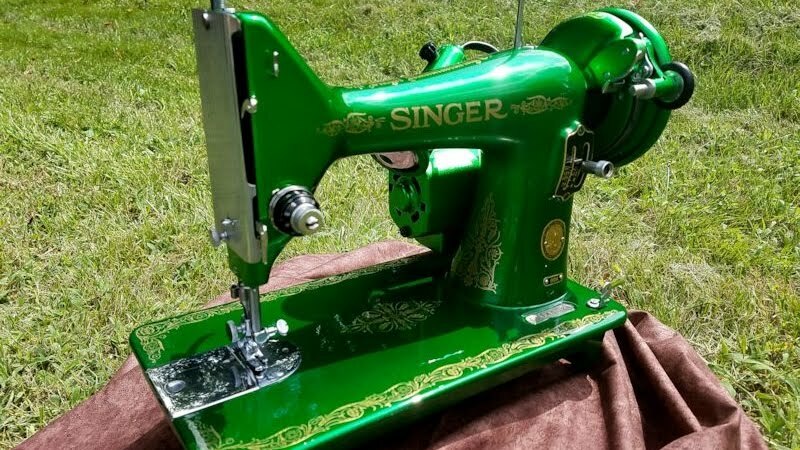 We also refinish cabinets, treadle irons, and vintage sewing machine cases. Interested in our services? Contact us! 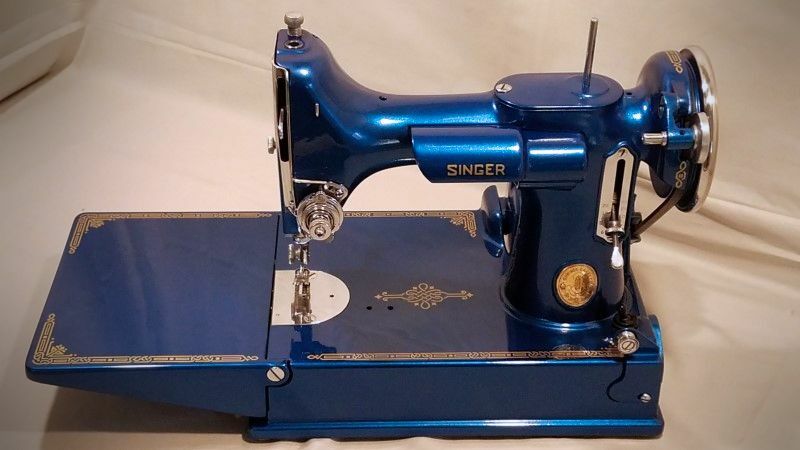 We are available for presentations to guilds and other groups interested in vintage sewing machines. Our focus is historical education. Contact us for more information. 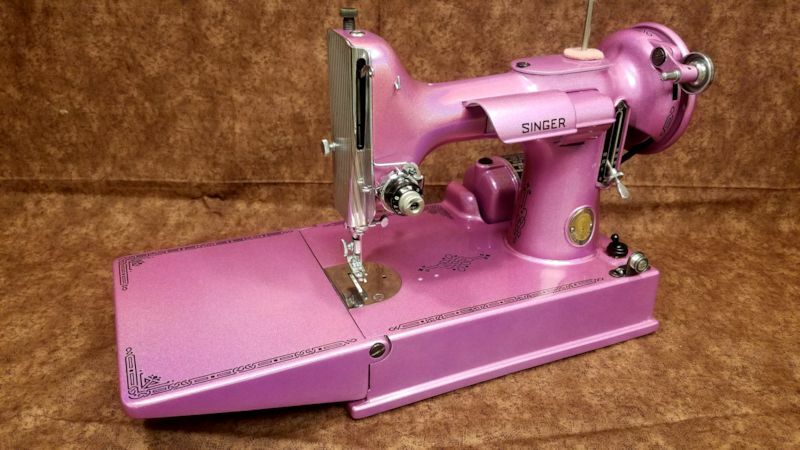 We publish articles related to vintage sewing machines on this site, but for abundant photos and information, follow our Facebook Page. You can also subscribe to this blog. 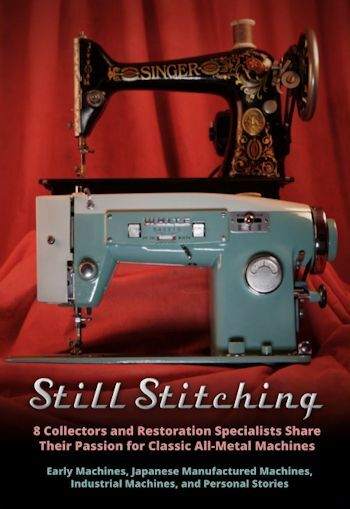 Still Stitching recommends Quilter's Connection for vintage sewing machine parts. Print is available signed by the artist.